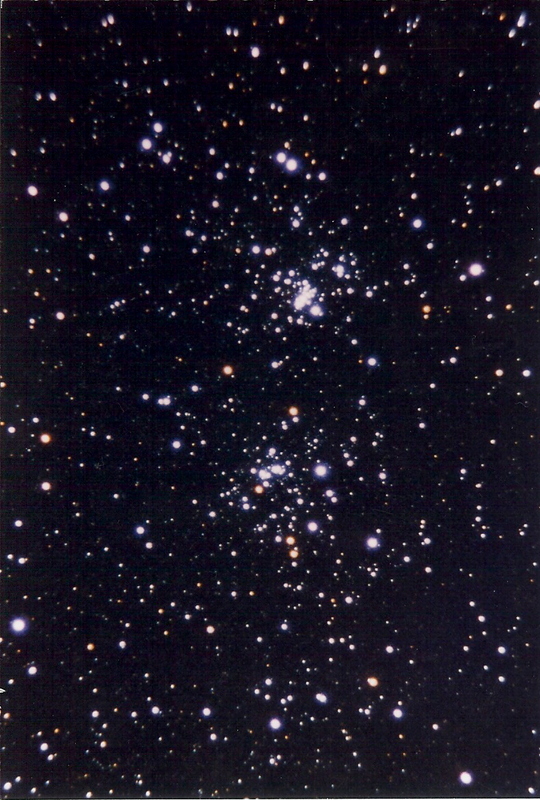 This page holds examples of astrophotography done by current or former members of BRAS They are listed alphabetically by photographer. Image format and size is listed, as well as information on where and how these images were taken, and comments from the photographer, when available. Thumbnails in JPEG format have been compressed in DPI and file size much more than the original images. In plain english, that means the thumbnails may not look as good as the original image. All images on this page are © copyright of their respective owners. Images may be downloaded for personal use and enjoyment only. Any other use requires the consent of the photographer. All rights reserved. 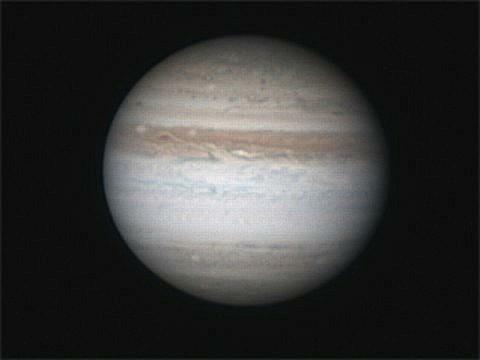 Jupiter Europa Shadow Transit Movie September 21, 2010 AVI movie 1.54MB. Includes Jupiter with Europa plus Europa shadow and Io. At this time Jupiter is as close as it's been in about 50 years. Taken in my driveway in Baton Rouge. Equipment: Meade 10" Reflector on Motorized German Equatorial Mount. Camera: 3Com Homeconnect USB Webcam at 640x480 through Orion 2X barlow. Video: 400 frames of captured AVI at 2 fps X 5 one for each frame of the movie. 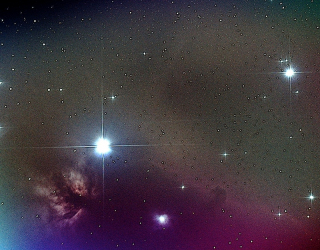 Processing Software: Registax, VirtualDub and Photoscape. Jupiter Europa Shadow Transit Image September 21, 2010 JPEG image 10KB. 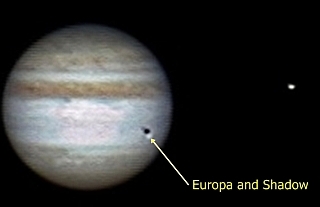 Includes Jupiter with Europa plus Europa shadow and Io. 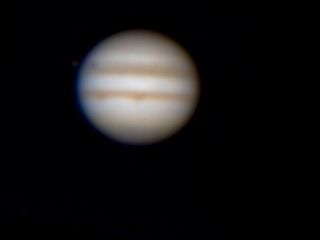 At this time Jupiter is as close as it's been in about 50 years. Taken in my driveway in Baton Rouge. Equipment: Meade 10" Reflector on Motorized German Equatorial Mount. 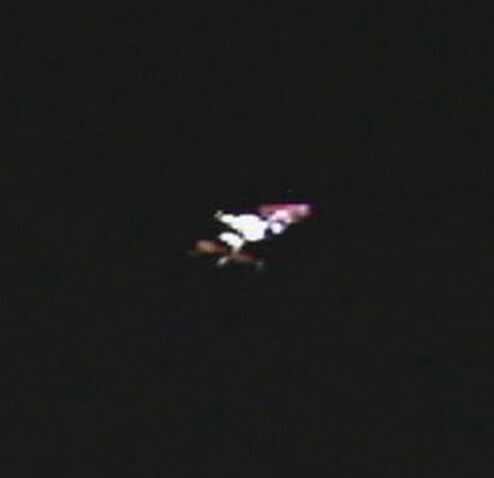 Camera: 3Com Homeconnect USB Webcam at 640x480 through Orion 2X barlow. Processing Software: Registax, VirtualDub and Photoscape. Jupiter Europa Shadow Transit Enlarged September 21, 2010 JPEG image 72KB. Jupiter Great Red Spot Movie September 23, 2010 AVI movie 1.76MB. 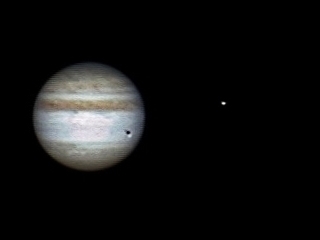 Includes Jupiter with Europa (farther out) and Io (closer in). Taken in my driveway in Baton Rouge. Equipment: Meade 10" Reflector on Motorized German Equatorial Mount. Camera: 3Com Homeconnect USB Webcam at 640x480 through Orion 2X barlow. Video: 400 frames of captured AVI at 2 fps X 6 one for each frame of the movie. Processing Software: Registax, VirtualDub and Photoscape. Jupiter Great Red Spot Image September 23, 2010 JPEG image 11KB. 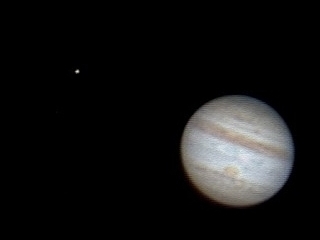 Includes Jupiter with Europa (farther out) and Io (closer in). Taken in my driveway in Baton Rouge. Equipment: Meade 10" Reflector on Motorized German Equatorial Mount. Camera: 3Com Homeconnect USB Webcam at 640x480 through Orion 2X barlow. 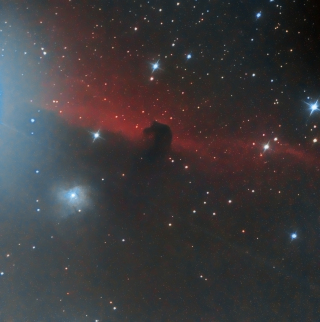 Processing Software: Registax, VirtualDub and Photoscape. 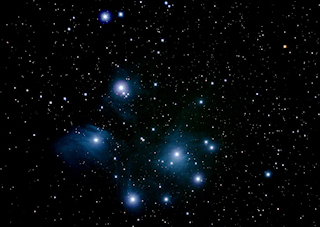 Constellation Orion February 7, 2008 JPEG image 604KB. 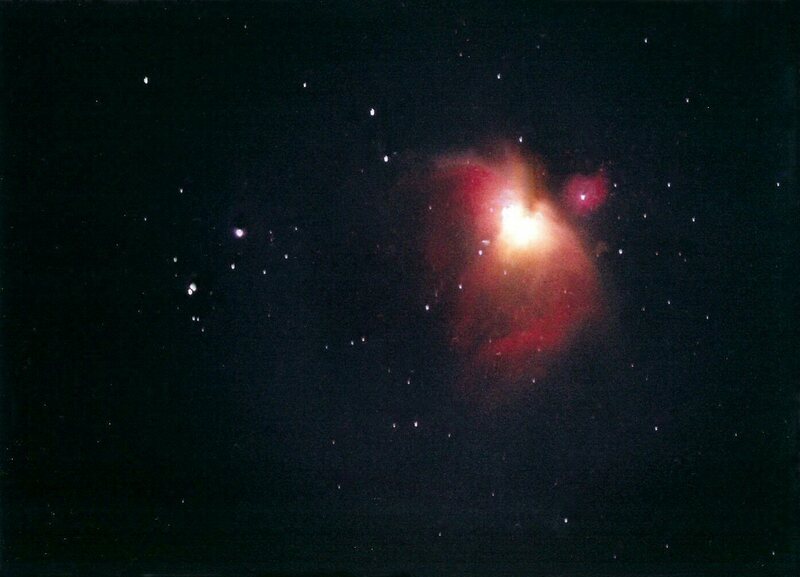 I took that Orion shot on Feb. 7th, 2008 using my Canon G5 Digital. It was an 8 second exposure, at f/2.2 on a tripod of course, out in my front yard. Very clear night. 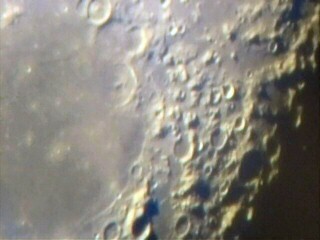 The Moon February 18, 2008 JPEG image 79KB. Taken using a Canon Digital G5 Powershot. Shutter at 1/250 & 1/500 f/3.2, out in my front yard tonight. The Moon February 18, 2008 JPEG image 78KB. The Moon February 18, 2008 JPEG image 245KB. The Moon February 18, 2008 JPEG image 249KB. The Moon February 18, 2008 JPEG image 258KB. 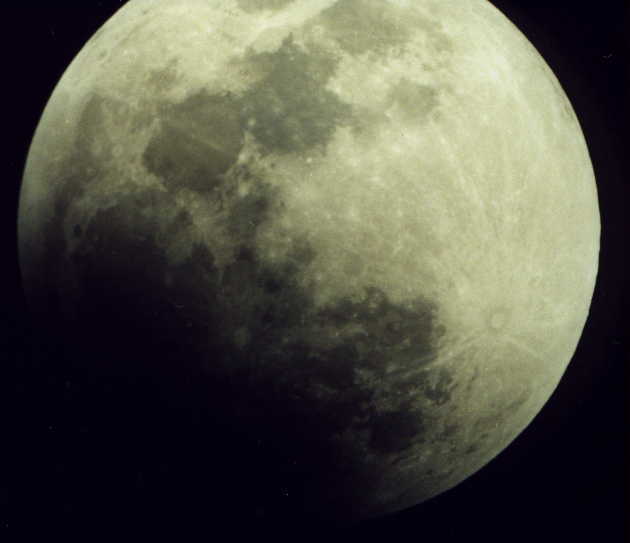 The Moon February 18, 2008 JPEG image 604KB. 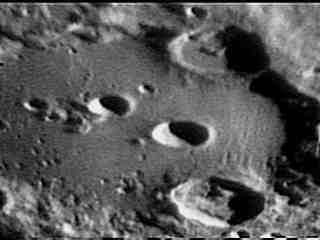 Moon Craters May 7, 2014 TIF image 6.9MB. 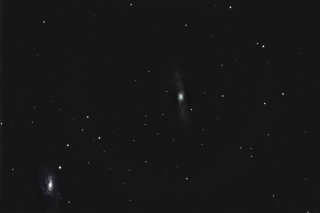 Taken with a Celestron Nexstar 6SE SCT using an Orion Star Shoot all in one camera. Time was 10:30 pm. 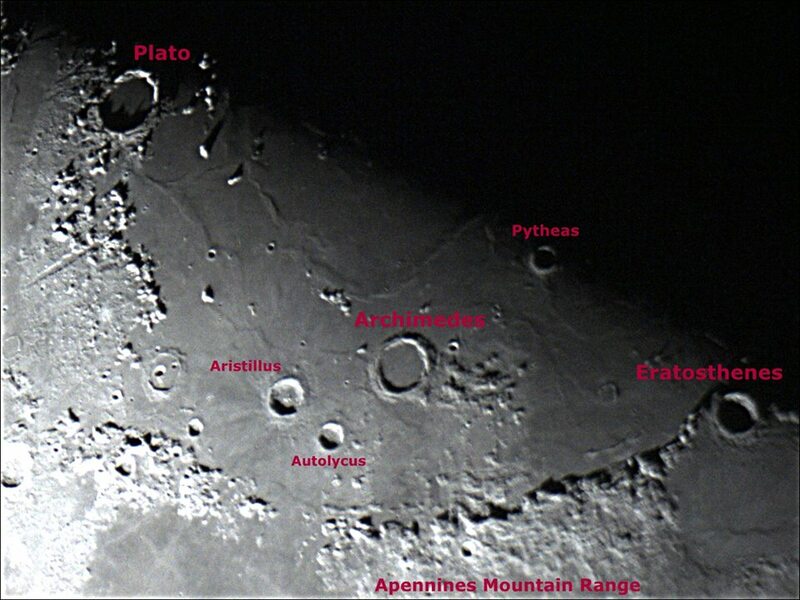 Moon Craters (with labels) May 7, 2014 JPEG image 120KB. Saturn June 3, 2011 JPEG image 23KB. 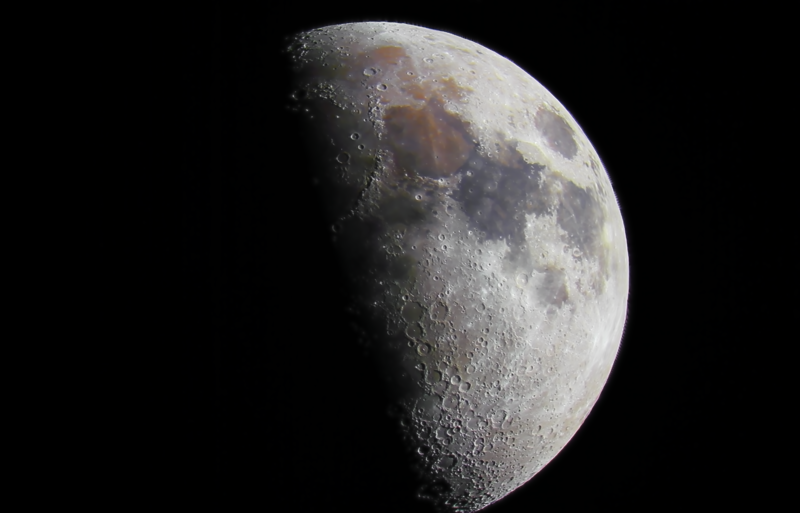 This was my first attempt at doing any photography with my telescope. Took last night from my driveway. I used my son's Canon 40D connected to my C8. Not as much detail as I would like but for a first time photo. I had several exposures and took the better exposure for the moons and pasted them in the correct spot with the planet. There was a lot of “heat monkeys” so the the air was not real stable. Sharpened it with software some and adjusted contrast. My C8 is an older model and it's on a Byers work gear drive. 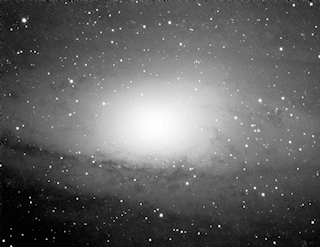 Andromeda Galaxy September 6, 2011 JPEG image 48KB. This photo of M31 - Andromeda was taken on the GRAS-003 telescope at Mayhill, NM. This is a 150MM Takahasi - TAO with SBIG color imager - Exposure 10 minutes, no correction. 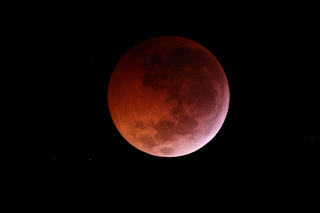 Time was 11:03 UTC. 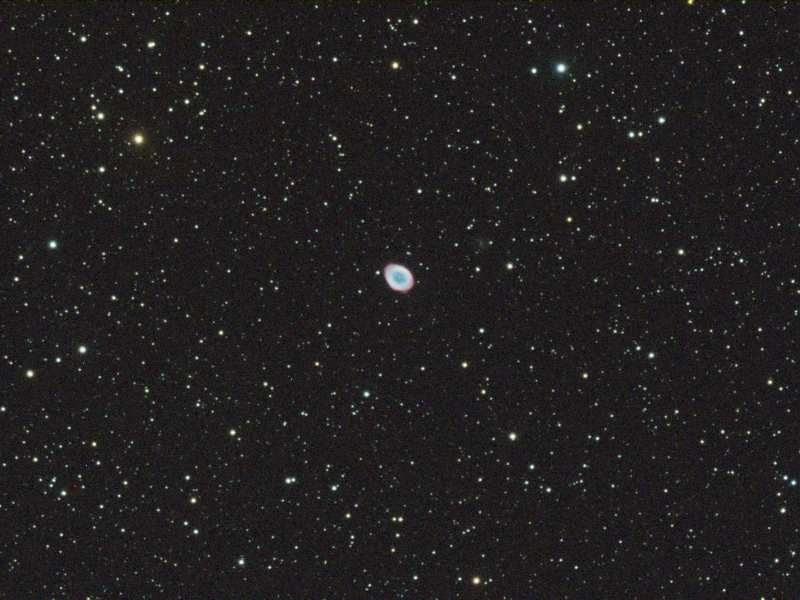 Ring Nebula September 7, 2011 JPEG image 104KB. 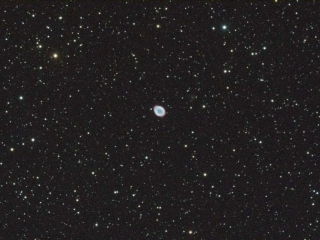 This photo of M57- Ring Nebula was taken on the GRAS-003 telescope at Mayhill, NM. 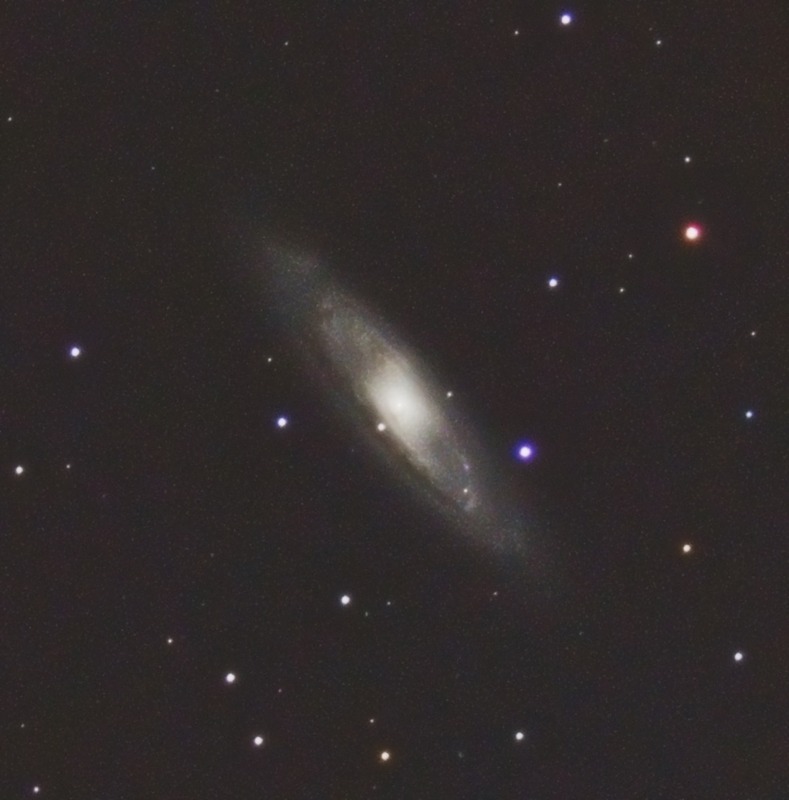 This is a 150MM Takahasi - TAO with SBIG color imager - Exposure 10 minutes no correction. 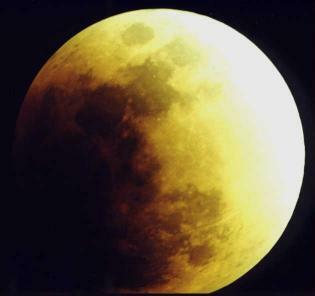 Time was 04:10 UTC . 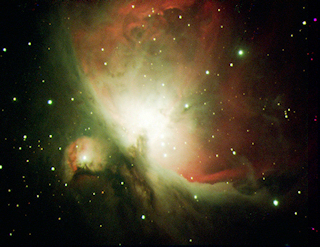 Orion Nebula September 11, 2011 JPEG image 3.57MB. Here is a photo I took at home in my backyard the morning of Sept 11th, 2011 at 4:45am. 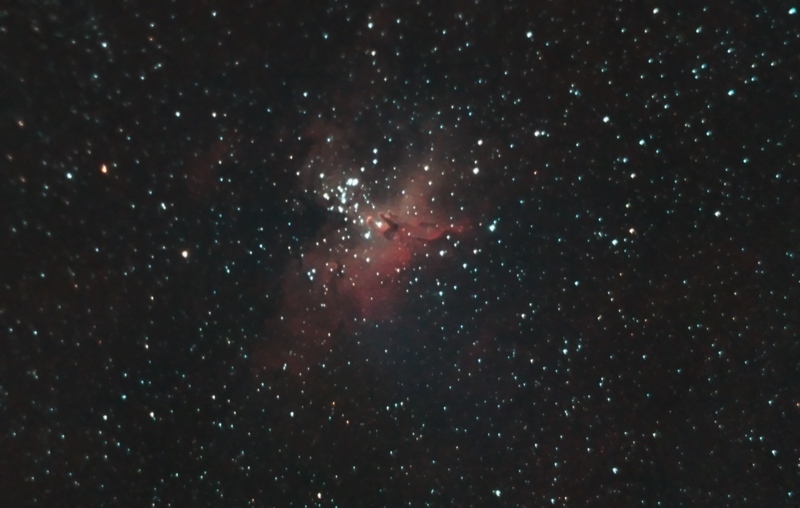 Celestron C8 with Direct Mounted Canon 40D at 10 seconds. Jupiter October 2, 2011 JPEG image 56KB. Telescope = Celestron C8. Camera = Canon 40D. Planet is stacked 5 - 1/16s Exposures at ISO200. Moons are from stacked 5 - 10s Exposures at ISO 1600. Images were combined with software. 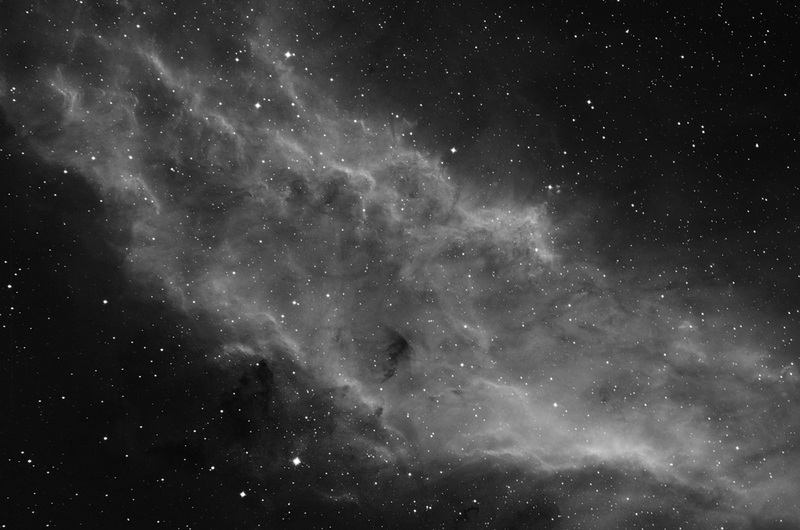 Used Nebulosity for stacking frames. 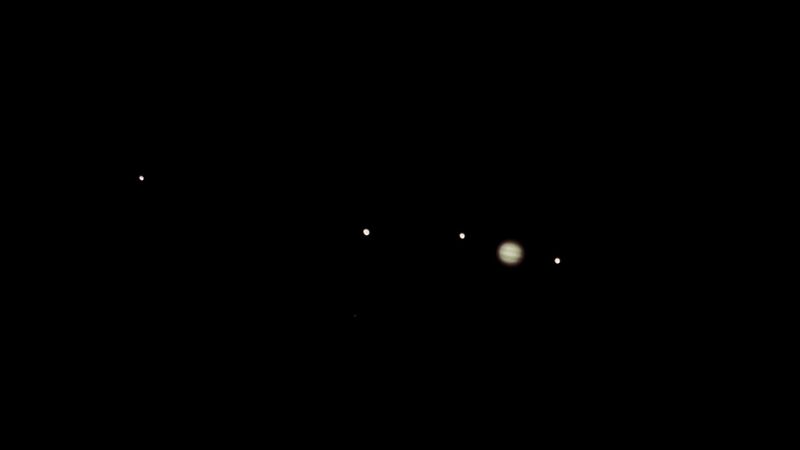 Moons from left to right are Calypso, Gannymede, Europa and Io. 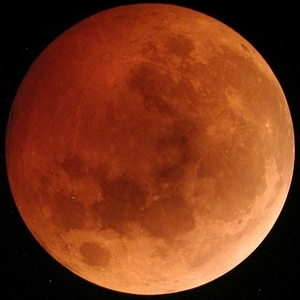 Moon October 3, 2011 JPEG image 632KB. 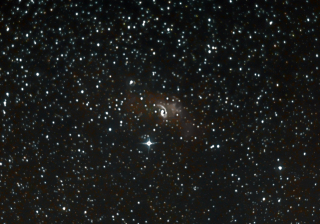 Celestron C8. Canon 40d. ISO 200 @ 1/80s. 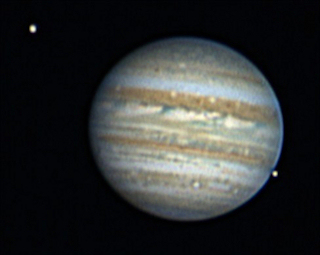 Jupiter November 12, 2011 JPEG image 20KB. 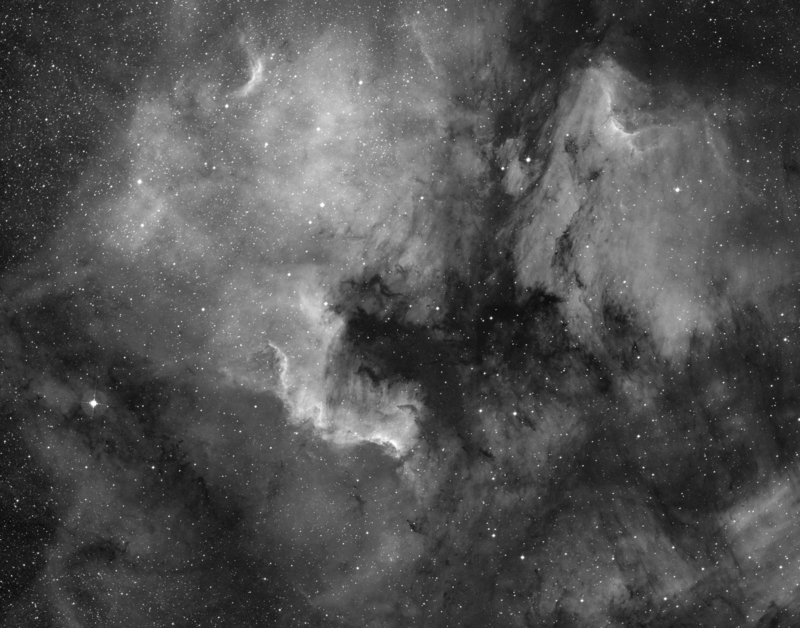 North American Nebula & Pelican Nebula 2004 JPEG image 1012KB. 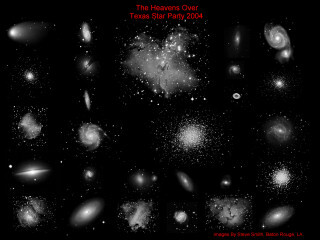 A 2 frame mosaic taken at the Okie Tex 2004 Star Party. 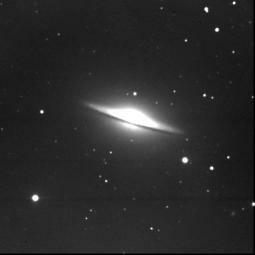 Scope: Takahashi E210 at f3, Camera: SBIG STL11000. Galaxy M51 2005 JPEG image 181KB. 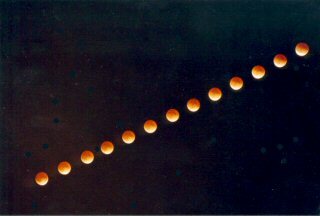 Taken at the Texas Star Party 2005, with a 12.5" Optical Guidance Systems RC. Camera: SBIG STL11000. Full Moon 2005 JPEG image 327KB. A .5 second exposure taken in the backyard with a 12.5" Optical Guidance Systems RC.Camera: SBIG STL11000. 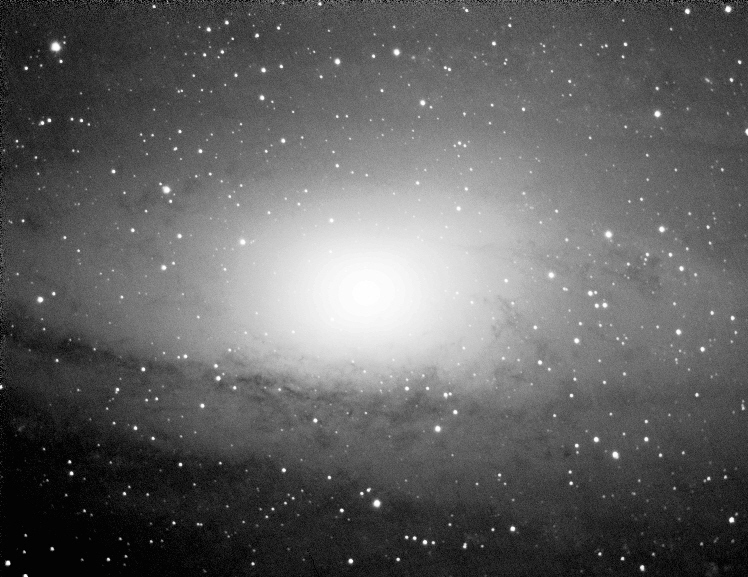 The Andromeda Galaxy - M31 2005 JPEG image 387KB. Taken at the Deep South Regional Stargaze. 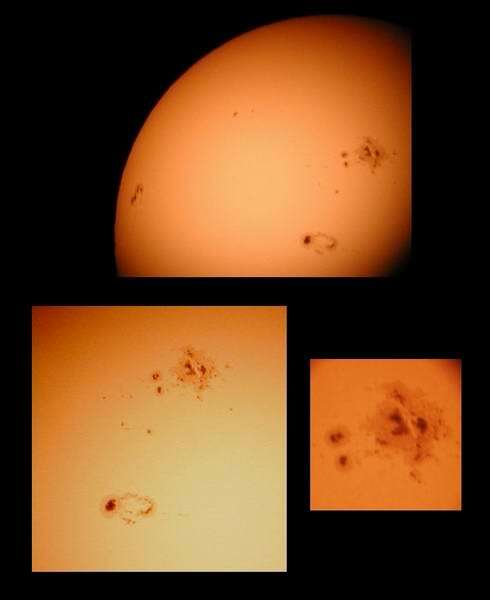 Scope: Takahashi E210 at f3, Camera: SBIG STL11000. California Nebula 2005 JPEG image 189KB. Horsehead & Flame Nebula 2005 JPEG image 766KB. 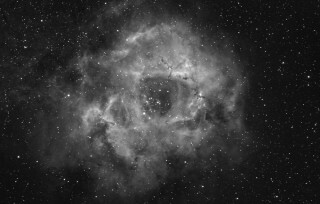 Rosette Nebula 2005 JPEG image 359KB. Taken at Franklinton, Louisiana. 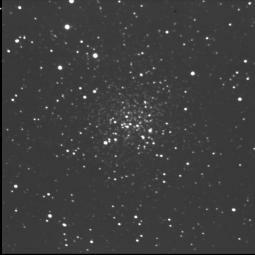 Scope: Takahashi E210 at f3, Camera: SBIG STL11000. 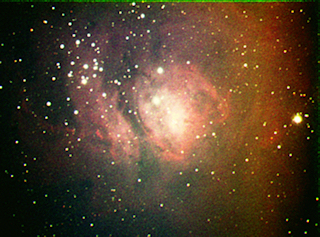 Cone Nebula & Fox Fur Region 2005 JPEG image 432KB. Taken in the backyard. 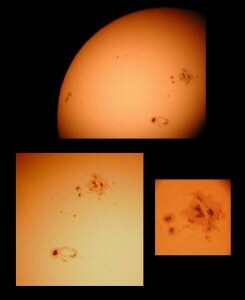 Scope: Takahashi E210 at f3, Camera: SBIG STL11000. Comet Hale-Bopp C/1995 O1 over M34 April 7, 1997 JPEG image 150KB. Taken with an OM 1 camera, 105mm lens, f 3.4, on Fuji Super 800 film. Exposure time was 20 minutes, with the camera guided piggyback on telescope. Photographed at the BRAS observing site in Clinton, LA. This was everyone's favorite. Was very pleased to have M34 below the comet, and was able to identify the specific stars in that group when I looked in Burnham's! 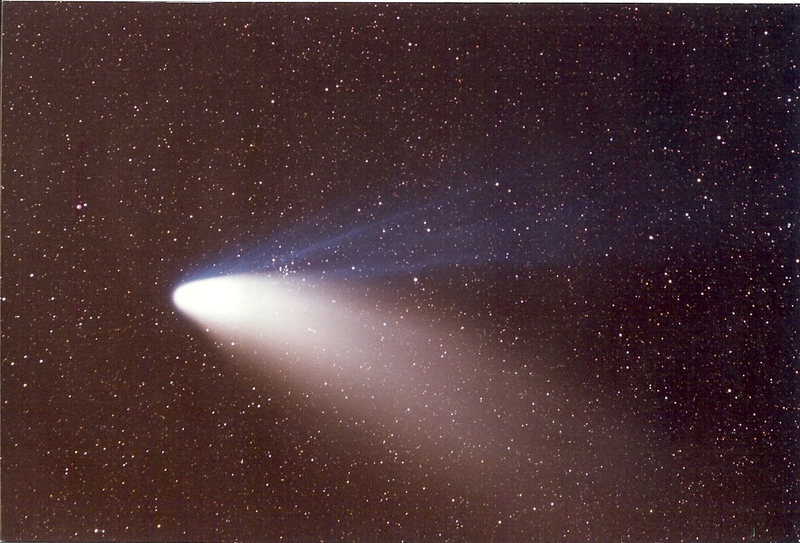 Comet Hale-Bopp C/1995 O1 April 7, 1997 JPEG image 131KB. Taken with an OM 1 camera, 105mm lens, f 3.4, on Fuji Super 800 film. 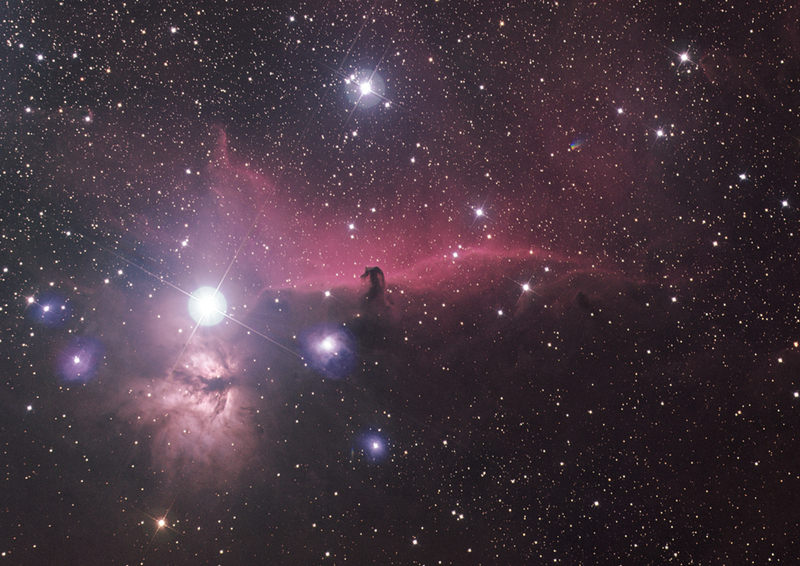 Exposure time was 5 minutes, with the camera guided piggyback on telescope. Photographed at the BRAS observing site in Clinton, LA. 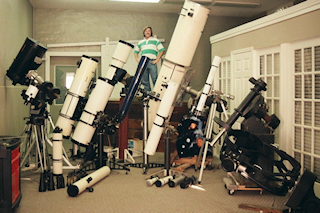 I think of this one as my "Observer with Comet" shot - note the front of the telescope. 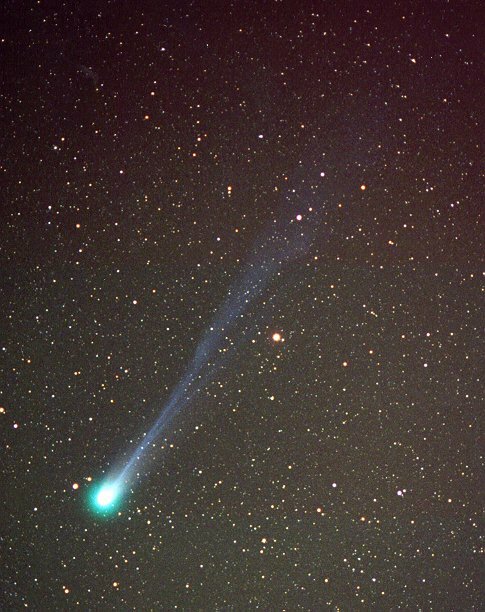 So there are several "depths" from the observer, then the trees at left, the plane crossing at lower right, then the comet, finally the rest of the heavens! Glad I could squeeze in the Pleiades also. Open Cluster NGC 2158 January 19, 2001 JPEG image 37KB. 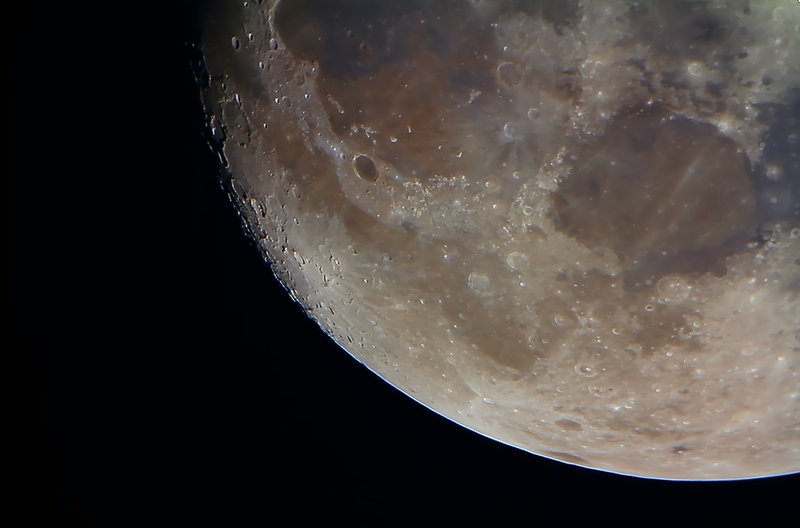 Taken with an Apogee AP-7 camera on a Meade 12" LX200 telescope remotely controlled from inside the house. Image is a composite of 20 separate images, each a 10 second exposure. 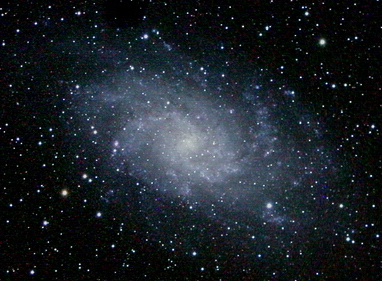 Galaxy M33 January 21, 2001 JPEG image 62KB. Taken with an Apogee AP-7 camera on a Meade 12" LX200 telescope remotely controlled from inside the house. Image is a composite of 5 separate images, each a 1 minute exposure. Nebula M1 January 24, 2001 JPEG image 45KB. Taken with an Apogee AP-7 camera on a Meade 12" LX200 telescope remotely controlled from inside the house. Image is a composite of 3 separate images, each a 1 minute exposure. 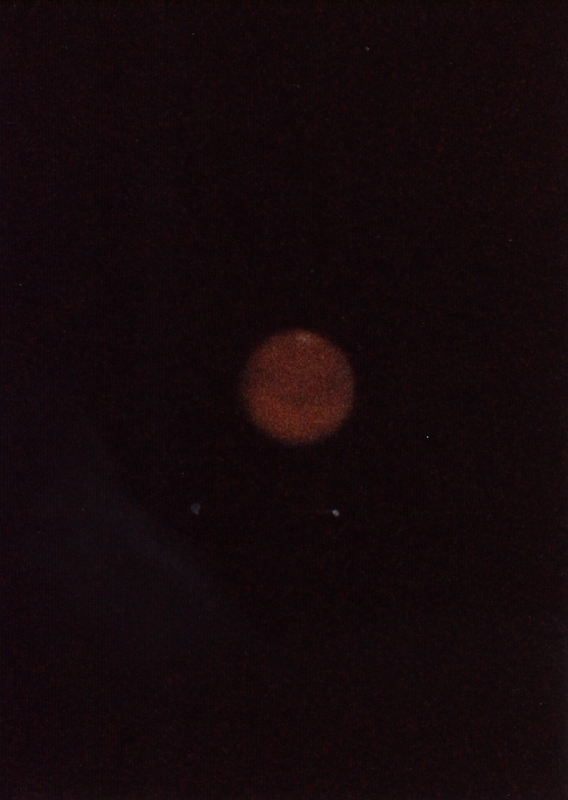 Galaxy M74 January 24, 2001 JPEG image 43KB. 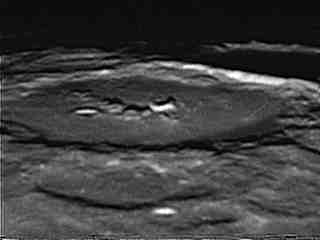 Taken with an Apogee AP-7 camera on a Meade 12" LX200 telescope remotely controlled from inside the house. 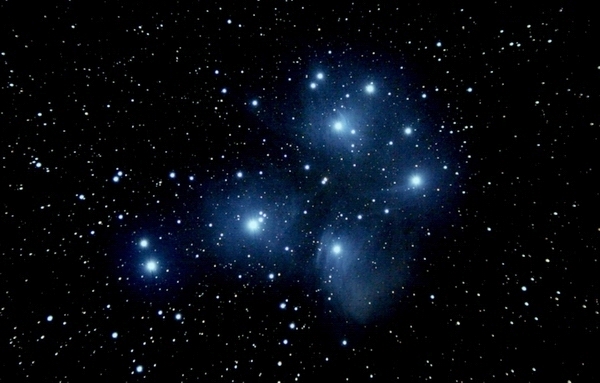 Image is a composite of 10 separate images, each a 30 second exposure. Globular Cluster M13 May 13, 2001 JPEG image 34KB. 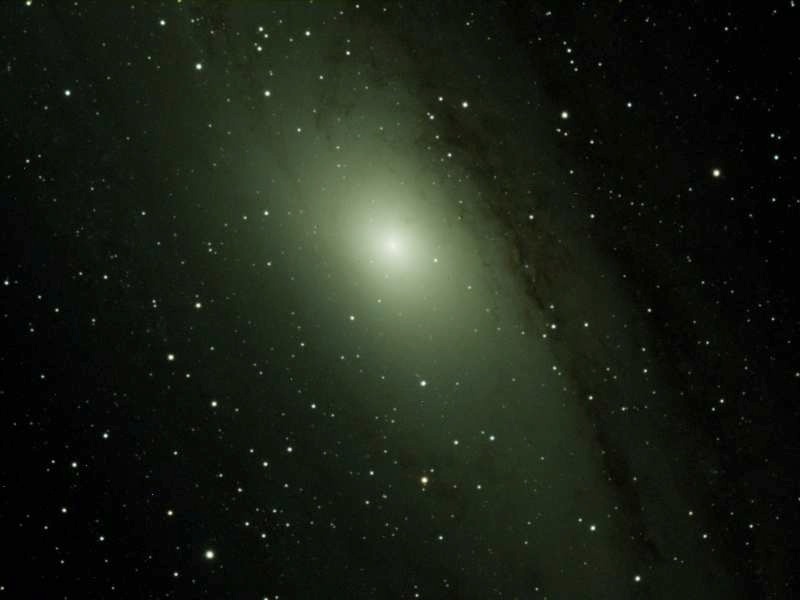 Taken with an Apogee AP-7 camera on a Meade 12" LX200 telescope remotely controlled from inside the house. Image is a 1 minute exposure. 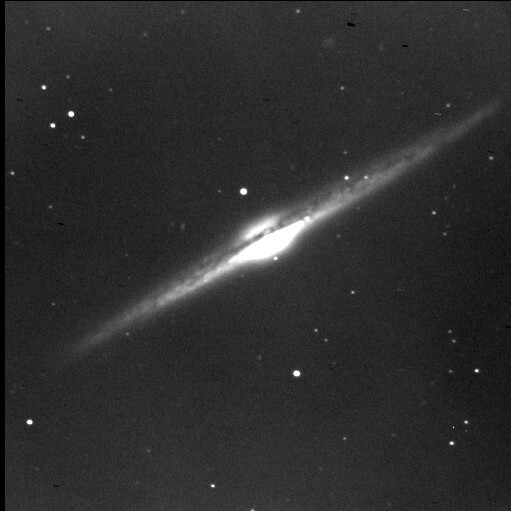 Galaxy NGC 4565 May 13, 2001 JPEG image 51KB. 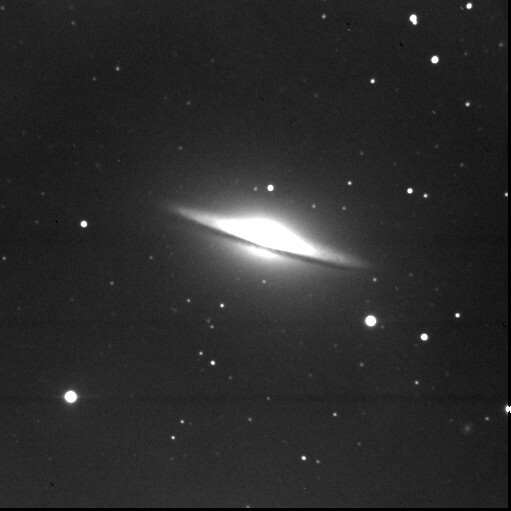 Sombrero Galaxy May 13, 2001 JPEG image 36KB. Comet Ikeya-Zhang March 13, 2002 JPEG image. 11KB. The images are two versions of the same image but processed to show different perspectives. 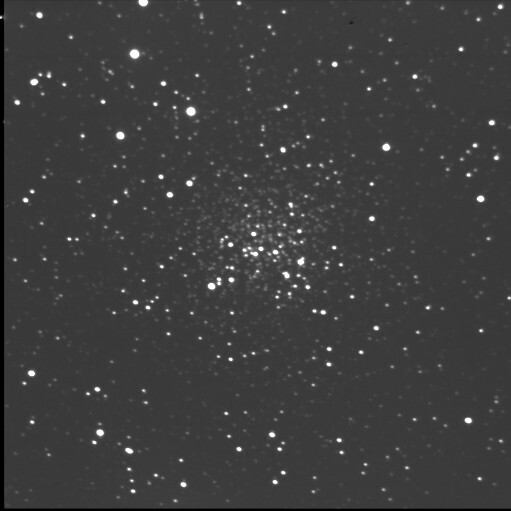 The base image is a combination of 50 ten second exposures with my 12 inch LX-200 and AP-7 at the Blackberry Observatory (in our backyard). 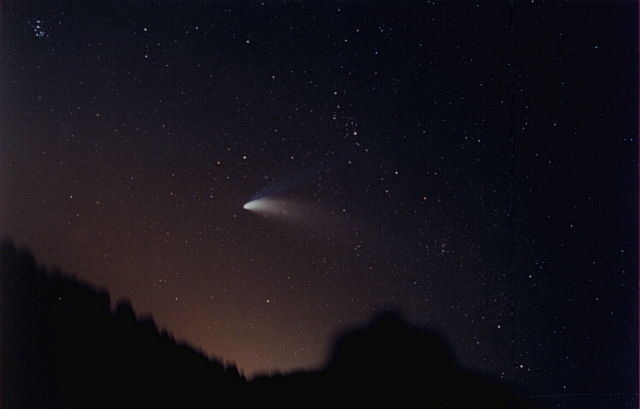 Comet Ikeya-Zhang March 13, 2002 JPEG image. 27KB. 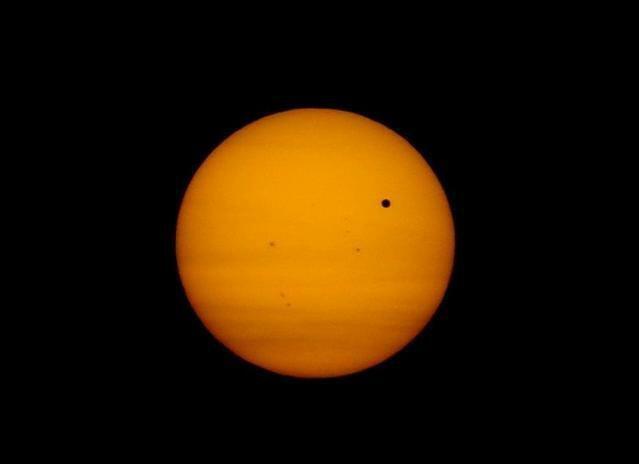 Venus Transit June 5, 2012 JPEG Image. 9.4KB. Canon T2i at Prime Focus on 2800mm f/10 SCT with 6.3 focal reducer (1764mm). 1 frame only ISO100 exposure 1:125 sec. 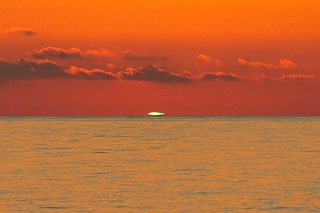 Green Flash Sunset October 5, 2012 JPEG Image. 1.34MB. 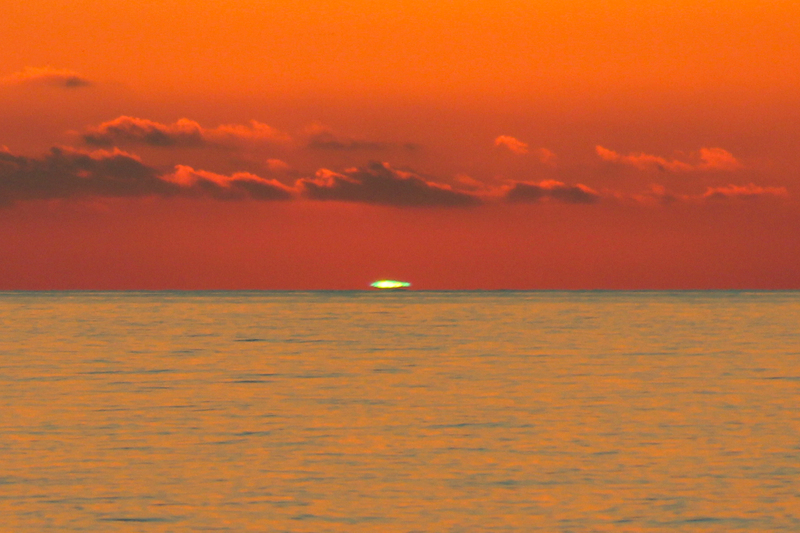 Taken in Destin, FL. 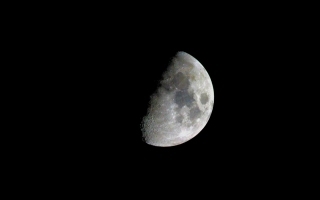 Camera on tripod - Canon T2i (550D), 1 frame 250mm f/5.6 1:500 second ISO 800. Best frame out of 20+ captured with “sports burst.” No color enhancement via processing - processed in Photoshop CS6 for cropping, resizing and conversion from Canon RAW (.CR2) to JPEG. 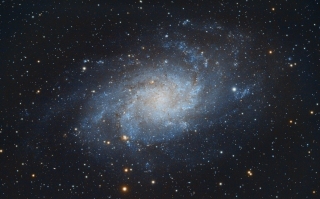 Image was featured in both Astronomy Magazine and Sky and Telescope Magazine digital newsletters. Voted a Favorite Image and Image of the Day by Astrobin.com. Blue Snowball Nebula (NGC 7662) December 29, 2011 JPEG Image. 1.75MB. Eyepiece Projection: 20mm EP in CPC1100 SCT (f/10 – 2800mm). 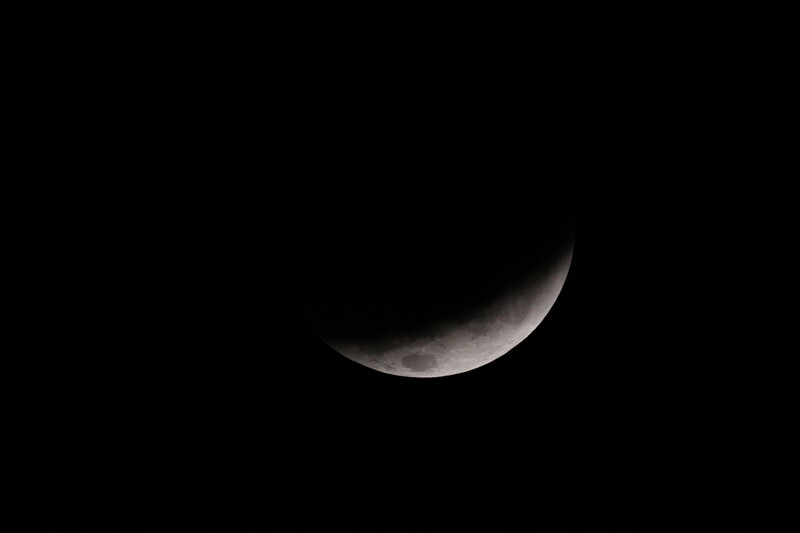 Canon T2i ISO 1600 20secs - 1 frame only. Daylight Moon July 24, 2010 BMP Image. 590KB. Handheld Canon T2i 18-55mm Zoom at 55mm – camera set to full automatic. New Year’s Moon January 1, 2012 JPEG Image. 4MB. 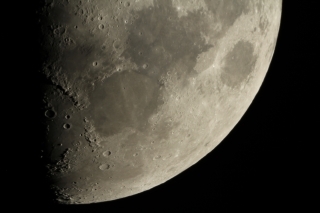 (1) single frame taken at prime focus (2800mm) f/10 with Canon T2i ISO 400 1:125 sec. New Year’s Moon January 1, 2012 JPEG Image. 3.62MB. Jupiter November 30, 2012 JPEG Image. 34.7KB. 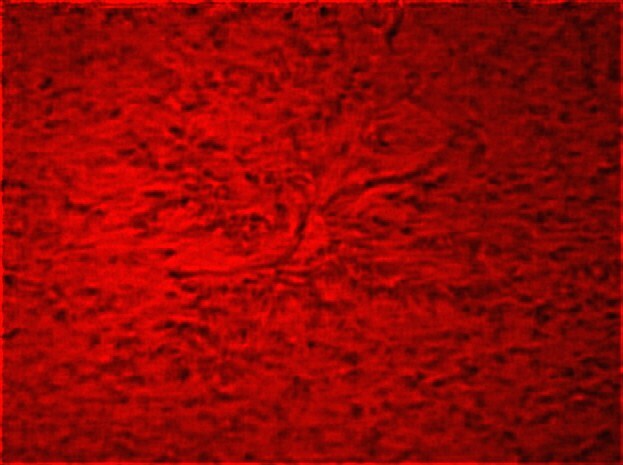 Orion Star Shoot Solar System Color Imager IV webcam. Best 50% of approx. 1250 frames. Stacked with AVIstack2 – Wavelets sharpening in Registax6 – final touchup in Photoshop CS6. 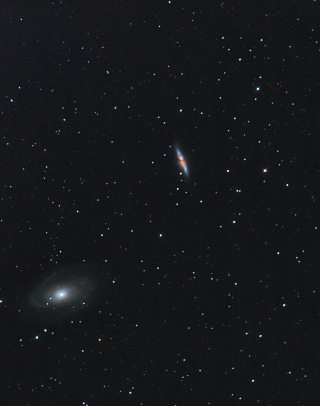 M65 & M66 in Leo April 3, 2013 BMP Image. 1.99MB. Stacked 14 out of 20 light frames with 14 Darks, 14 Flats, 14 Dark-flats- and 14 Bias. 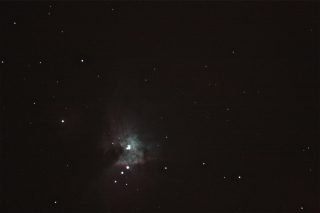 Canon T2i at Prime Focus of CPC1100 with focal reducer (f/6.3 - 1764mm) ISO800 90secs per exposure. CPC1100 set up on equatorial wedge for polar alignment. The Trapezium January 24, 2011 BMP Image. 1.99MB. 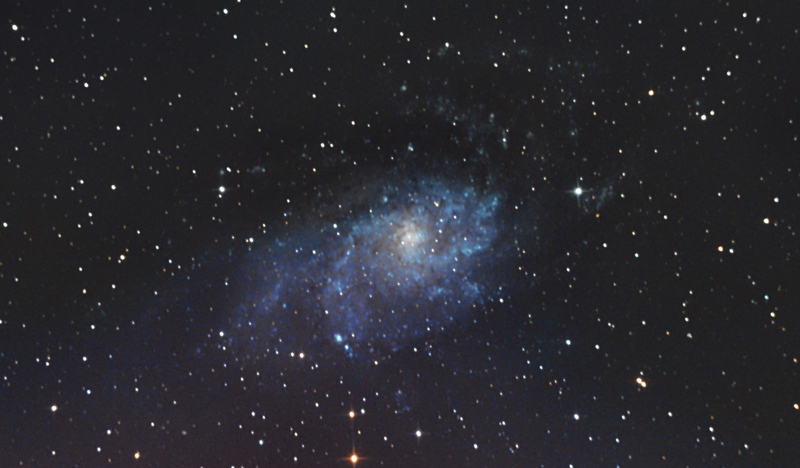 A focal shot of view with 17mm eyepiece in 11” SCT f/10 2800mm (165X) star diagonal installed. Canon T2i with 18-55mm Zoom set to approx. 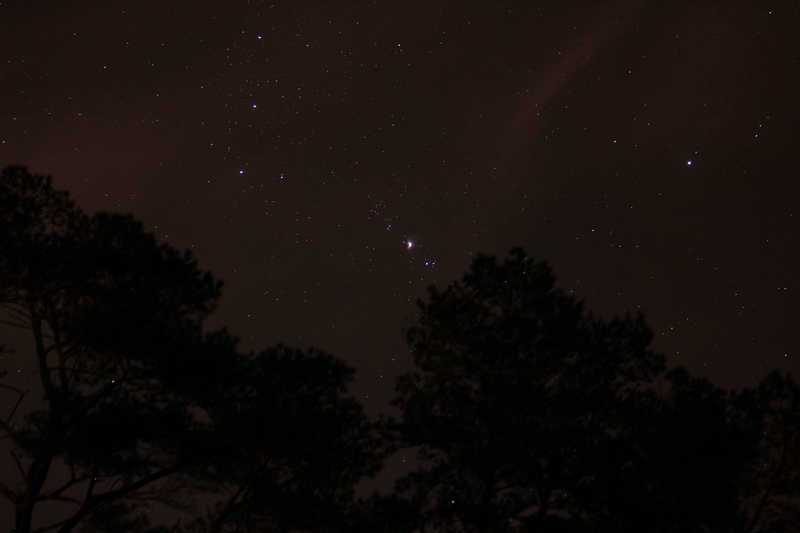 25mm f/5.6 - 1 frame – ISO 400 - 10 secs. 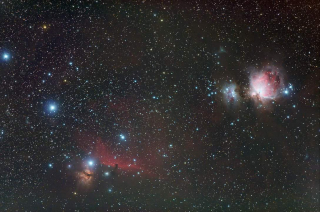 Wide Field Orion December 28, 2011 JPEG Image. 6.58MB. 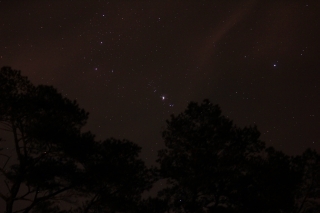 Wide field image in moderate-heavy light pollution near Denham Springs, LA. “Piggyback” photo with Canon T2i – 55-250mm IS Zoom (at approx. 150mm) mounted on CPC1100 in Alt-Az mode. 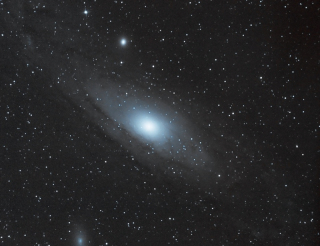 Piggyback M31 Autumn, 2012 PNG Image. 51.6KB. 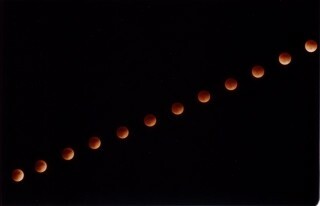 Best 4 frames out of 10 at 55mm f/5.6 Canon T2i ISO 800 - 45 seconds. Piggybacked on CPC1100 in Alt-Az mode. Stacked in Deep Sky Stacker – post processing in Photoshop CS6. 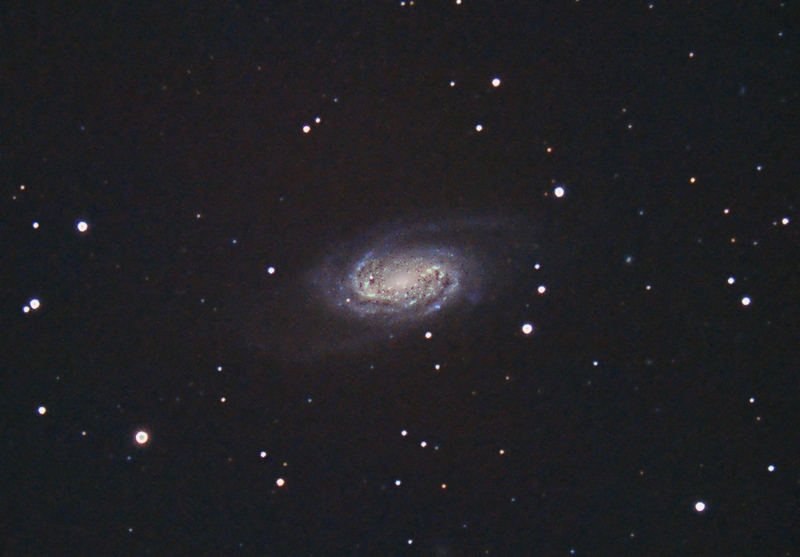 Galaxy NGC 2903 October 28, 2013 JPEG Image. 1.25MB. 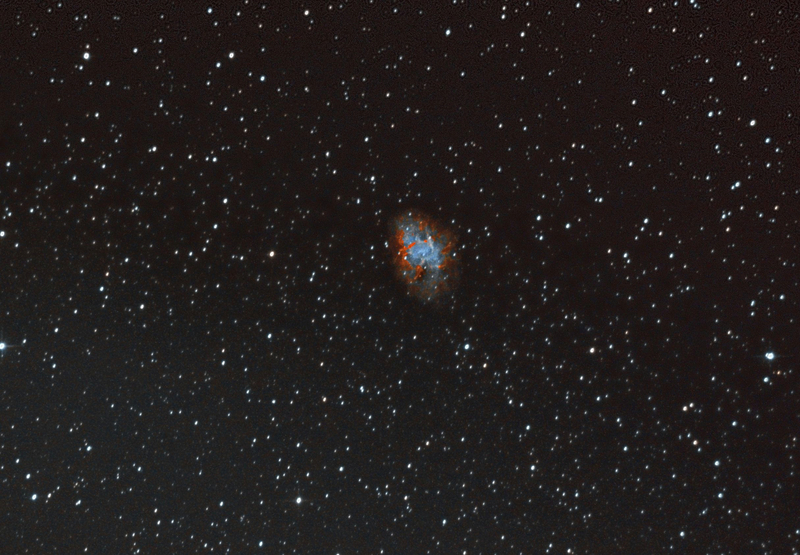 (8) 5 minute frames at ISO 800. f/6.3 - Processed with Pixinsight. Saturn Movie July 3, 2011 AVI Movie. 607MB. 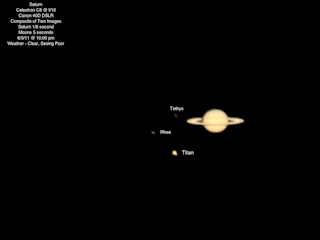 Video of Saturn with Orion Star Shoot webcam. 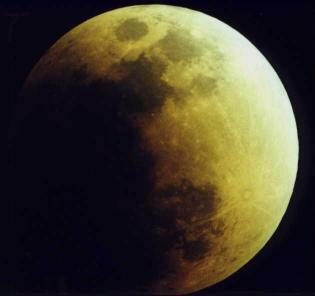 Moon Terminator 2011 JPEG Image. 7.95MB. 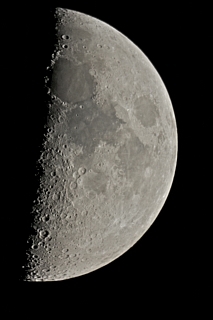 Quarter Moon near terminator. Canon T2i. Prime focus. Celestron CPC1100. Single frame. 1/125 second. ISO 100. Reprocessed with Pixinsight. 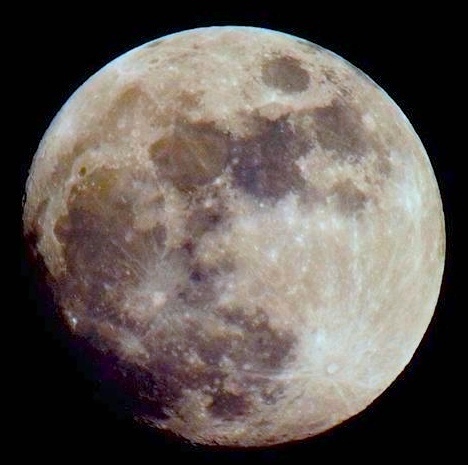 Moon 2014 JPEG Image. 235KB. Camera: CanonT2i. Capture Software: Backyard EOS in Planetary mode. Best 100 frames out of 2000 @6400ISO 25FPS. Stacking: Autostakkert2. Processing: Pixinsight using Restoration Filter, Curves Trasformation, Color Saturation. 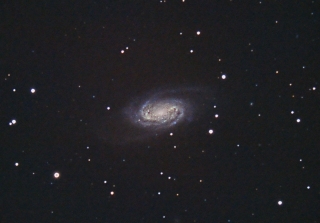 Galaxy M65 no date given JPEG Image. 216KB. An older Photoshop file I have reprocessed using Pixinsight. Galaxy NGC 2905 Redux no date given JPEG Image. 2.25MB. 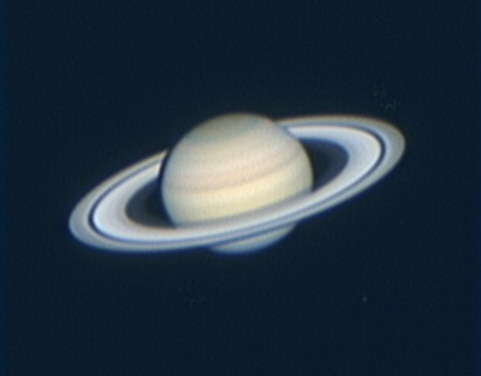 Saturn May 25, 2014 JPEG Image. 55KB. 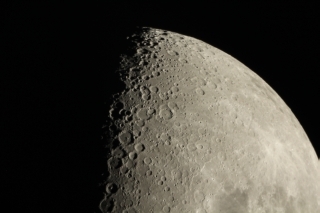 Shot with a CPC1100 (2800mm) @f/10 Canon T2i DSLR using BackyardEOS Premium 3.03 in Planetary Mode. ISO6400, shutter speed 1-8sec, Frame rate of video capture was 26.7 FPS. 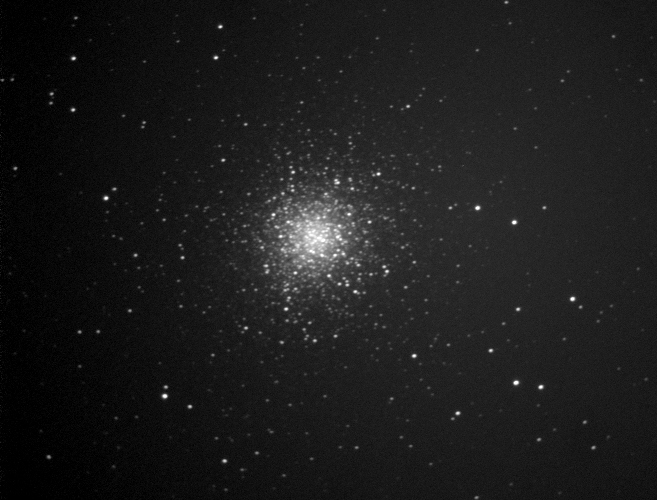 Best 650 of 1000 frames staked with Autostakkert2. Stacked image processed with Pixinsight. 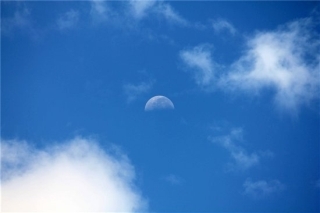 First Quarter Moon July 5, 2014 PNG Image. 391KB. 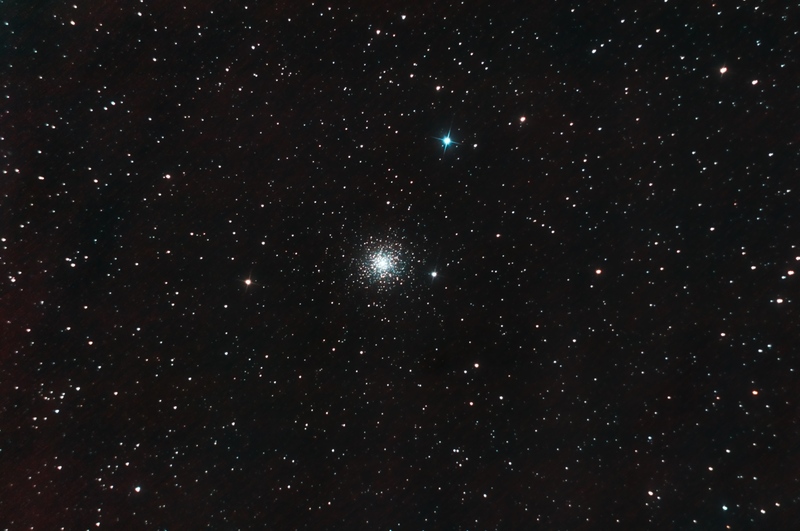 Celestron CPC1100 with 0.63 focal reducer. Canon T2i DSLR using BackYardEOS to capture 800 frame AVI. 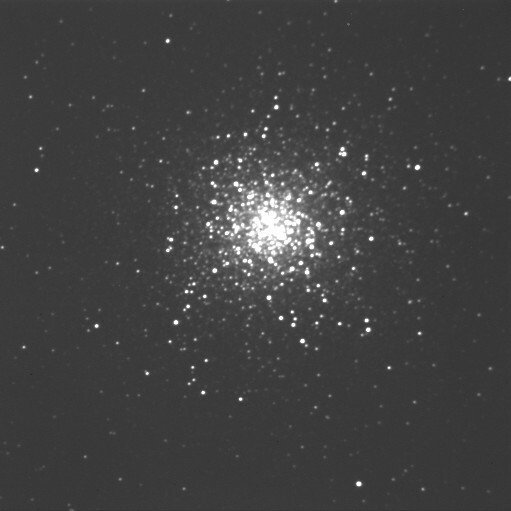 Best 400 frames stacked using Autostakkert2. Post Processing with Pixinsight. First Quarter Moon July 5, 2014 PNG Image. 2.71MB. 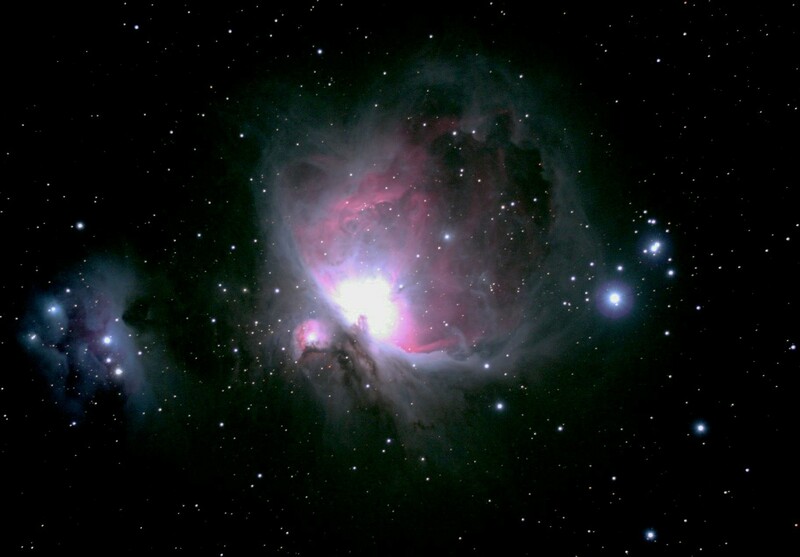 Orion Nebula (M42) JPG Image. 7.66MB. Composite image processed in Pixinsight. 16 frames@ 300 seconds, 10 frames@ 120 seconds, 10 frames @ 20 seconds. 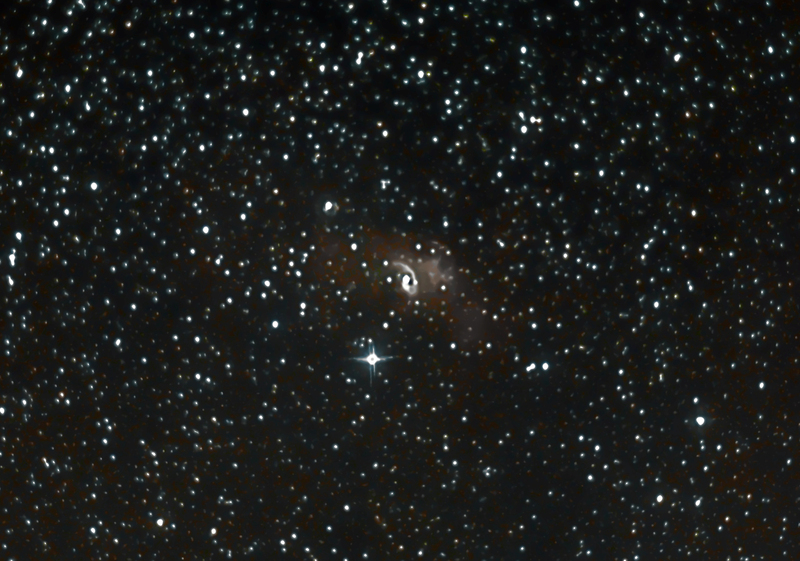 Celestron 800 EdgeHD with Starizona .75 focal reducer. Canon 60Da DSLR. BackyardEOS capture. Location: Tucson, AZ. Data by Ray Morris. Processing by Chris Desselles. CPC1100 @F/6.3 (1764mm) Canon T2i @ ISO 800, 36 lights @300 seconds, 24 Darks, 60 Bias - Processing with PixInsight. 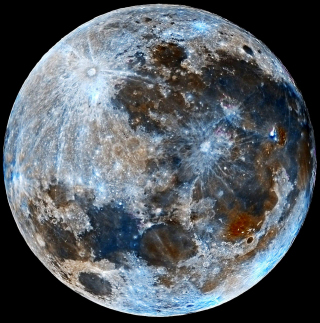 “Blue Moon” JPG Image. 247KB. Actual photo was a single frame taken in 2014. The image you see was heavily saturated and blue shifted to produce the “faux Blue Moon” as a bit of a joke on Facebook. Even though I confessed to the “photoshopping” a number of people still thought it was real! When I explained what I did, a few even got mad at me. 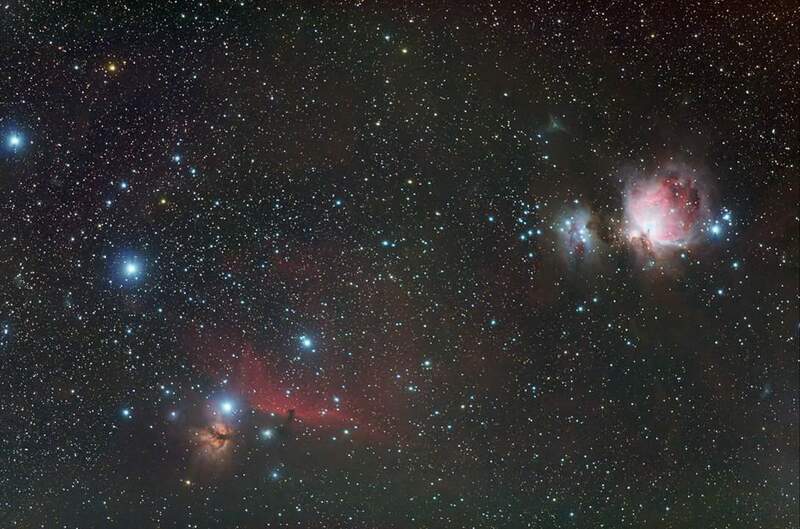 The Sword and Belt of Orion JPG Image. 110KB. Piggyback shot with Canon T2i DSLR – original data from late 2014 (just got around to processing it). 24 frames @ 90s with equal Darks and Bias (no flats). 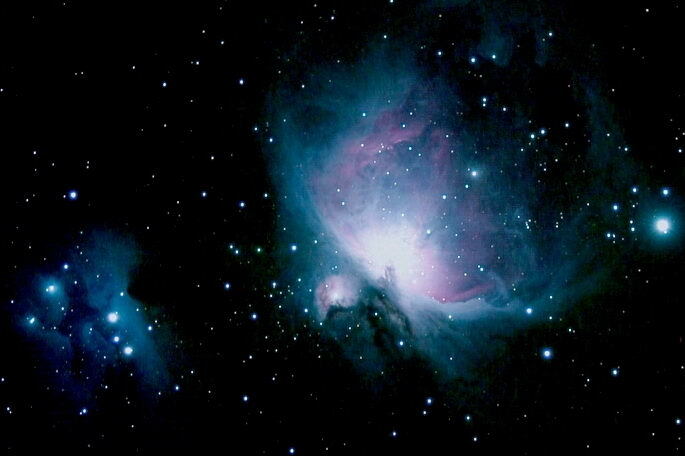 M42, The Orion Nebula January 27, 2004 JPEG Image. 194KB. Taken on 27 January 2004 from Professor Franks's front yard in Baton Rouge, Louisiana. 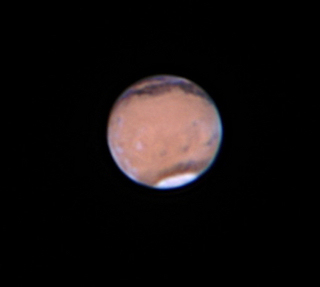 Shot at prime focus with a conventional Ricoh 35 mm camera using as its lens a six-inch (diameter) Celestron refractor telescope on a computer-driven German equatorial mount. Focal length 1,200 mm (47.24 inches); effective focal ratio f/7.87. Exposure on Agfa ISO 800 film for 10 minutes, using an LPR (light pollution reduction) filter. 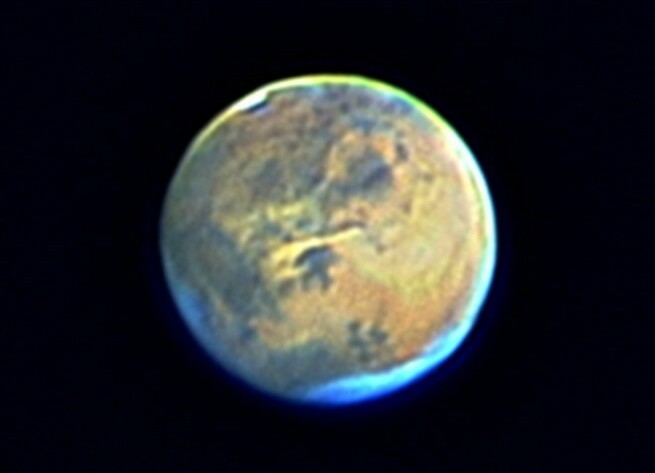 Mare Humorum April 1, 2004 JPEG Image. 96KB. 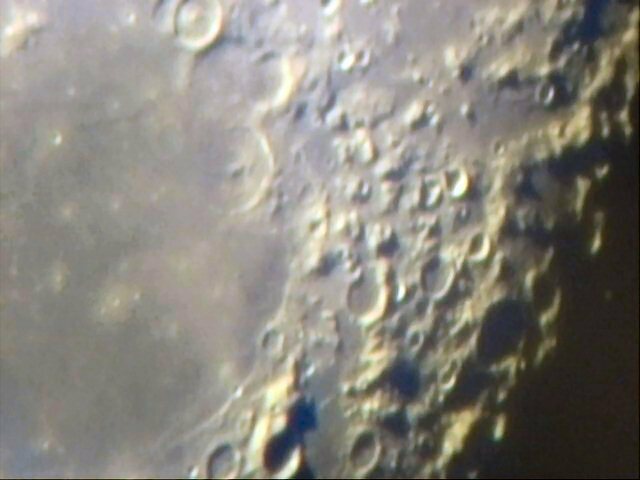 This picture is of Mare Humorum, a region of the Moon containing craters 3.3 billion years old. 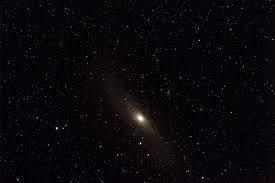 Photo consists of one thousand pictures taken digitally with a modified Philips Toucam webcam used as a CCD (charge-coupled device), using as its lens a six-inch (diameter) Celestron refractor telescope. 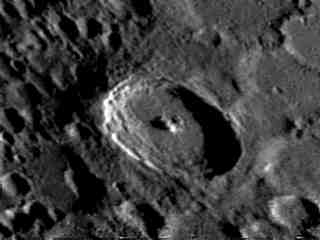 Clavius Crater GIF image 245KB. Taken with a 10" f/6 focal ratio Newtonian Reflector, using a CCD video camera, Snappy video frame grabber, and Sky Pro software for image manipulation. 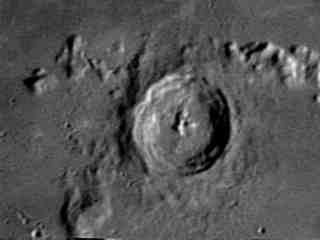 Copernicus Crater GIF image 251KB. Hadley's Rilles GIF image 306KB. 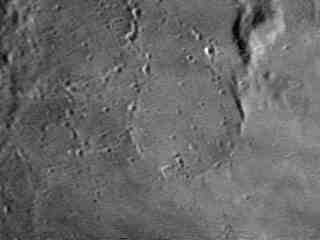 Humboldt Crater GIF image 217KB. Langrenus Crater GIF image 283KB. Mount Pico GIF image 170KB. 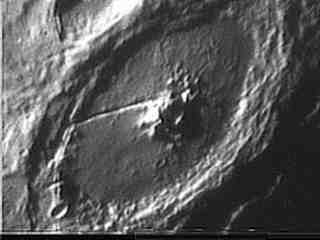 Petavius Crater GIF image 301KB. 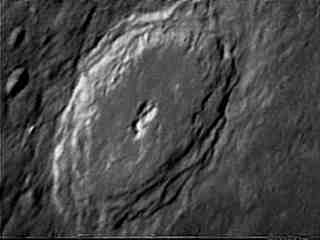 Plato Crater GIF image 254KB. 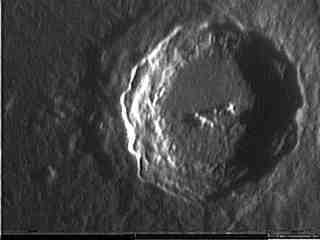 Stadius Crater GIF image 202KB. 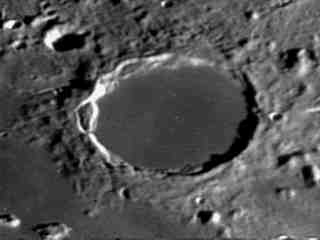 Tycho Crater GIF image 264KB. 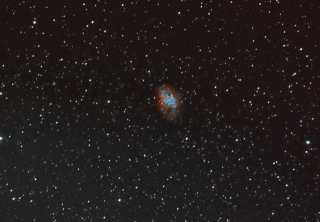 C5 at f3.3 0n modified Celestron Byers mount with Meade DSI Pro2. 30 sec exposures X 10. Taken off my balcony while watching the Saints on TV. No guiding. 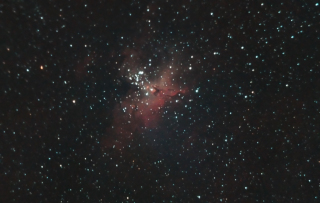 Taken with Takahashi FS 102 with f/6 reducer on Losmandy G11 Gemini mount with modded Cannon XSi. 10 X 3min exposures without guiding. 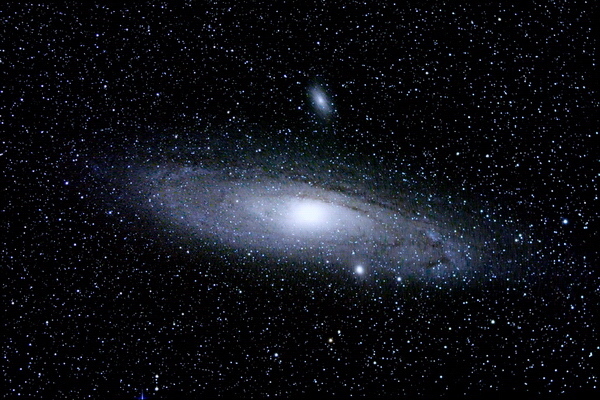 Processed with Deep Sky Stacker and Deep Sky Imaging. Taken with C8 at f11 with Malincam Color Hyper plus recording to an Arcos 605. The C8 was mounted on a Vixen GP mount with Meade LXD 75 electronics on a homemade pier. The scope was hand guided with a 3 foot piece of aluminum tubing duct taped on the side of the tube for more leverage and visually guided through a Telrad. 10" f/6 Newt with 5X powermate to a Toucam. Approx. 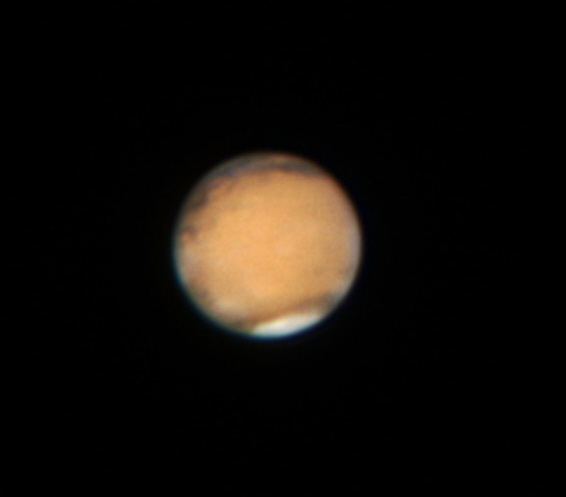 1000 frames stacked and processed in Registax. 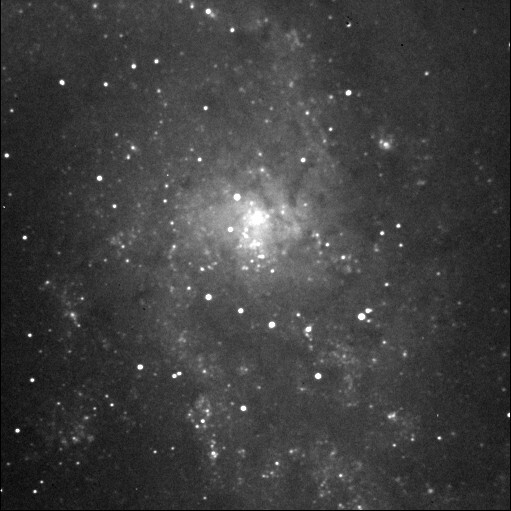 10" f/6 Newt with 5X powermate to a Toucam. Approx. 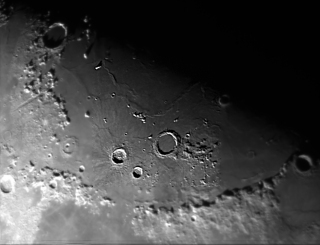 1000 frames stacked and processed in Registax. Note the dust storm in Valley Marinaris. 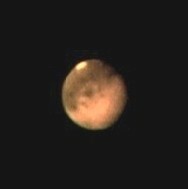 PST with 2X Barlow to Toucam. 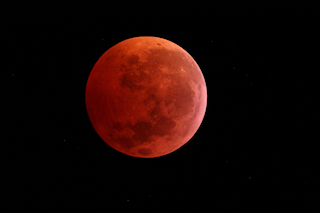 Processed in Registax. Charles with a “few” of his scopes. 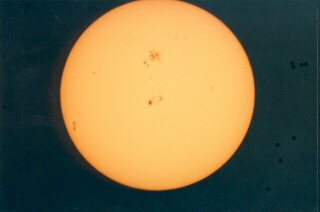 Taken with 80mm f6 semi apo refractor and Nikon FE with ASA 400 film. About 20 min exposure. Same 80 mm f6 refractor on ASA 800 film. about 30 minutes. 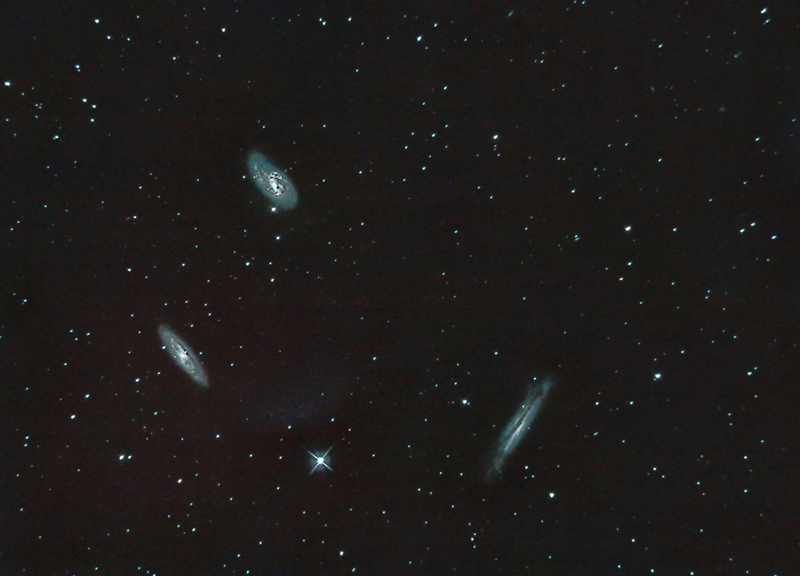 C5 at f3.3 to Meade DSI Pro 2 RGB each color about 30 sec X 10. C5 f/6.3 Meade DSI Pro 2. 30 sec X 20. C5 at f3.3 to Meade DSI Pro2 RGB. each 30 sec X10. C5 at f/6.3 to Meade DSI Pro2. RGB each 30 sec X20. Takahashi FS 102 at f/6 to modded Canon XSi. 3 min X10. 10" f/6 Newt with 5X Powermate to IS DBK21 AU04. 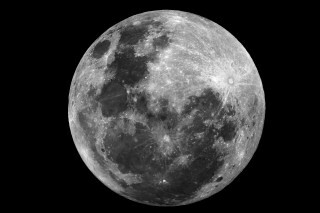 1000 images processed with Registax. 10" f/6 Newt recorded to videotape with Murnahan camera. Frame grabbed with Snappy. 10" f/6 Newt with 3X barlow to Murnahan camera. Recorded on videotape and grabbed with Snappy. 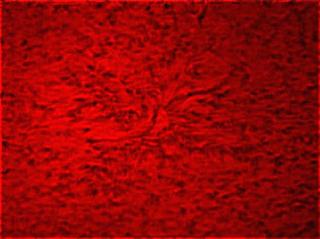 C14 2X barlow Imaging Source DBK21 camera. 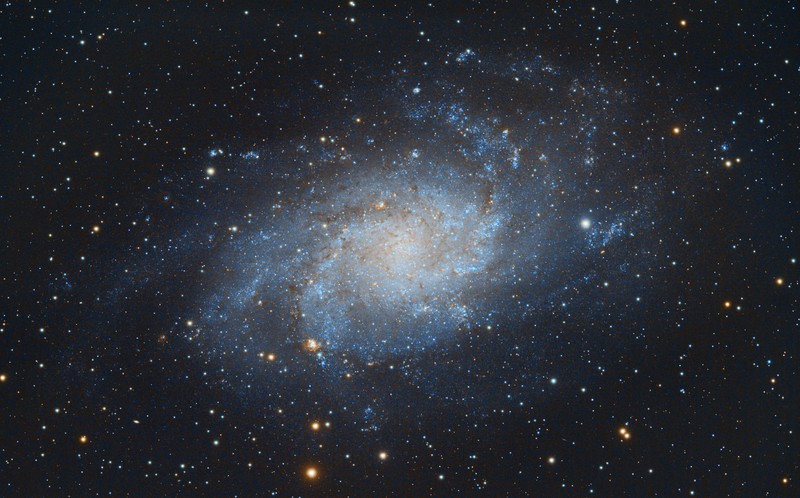 1000 images processed in Registax. Canon EOS DIGITAL REBEL XSi, 1/2000 sec. exposure time, ISO-800. Canon EOS DIGITAL REBEL XSi, 1/2000 sec. exposure time, ISO-1600. Canon EOS DIGITAL REBEL XSi, 1/1000 sec. exposure time, ISO-1600. Canon EOS DIGITAL REBEL XSi, 1/5 sec. exposure time, ISO-1600. Canon EOS DIGITAL REBEL XSi, 1/2 sec. exposure time, ISO-1600. It was taken using a Canon AE-1 with a 50mm f1.4 lens piggy-backed on a Meade 2080B (8" Schmidt-Cassegrain). The exposure time was 1 minute on Kodak 400 Royal-Gold color film. 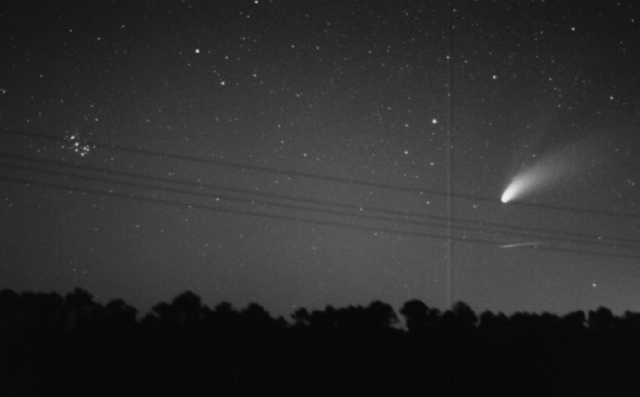 I took the picture from dark skies in Mississippi where the tail could be seen with the naked eye. This was my second attempt at piggy-back photography. With the comet I took about 20 pictures ranging from 5 secs to 3 minutes. I was really surprised at the quality I got with not much effort. I have yet to see much better in the astro magazines. I guess we can call it beginners luck. 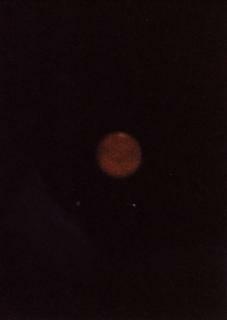 The bright object near the tail is Arcturus. 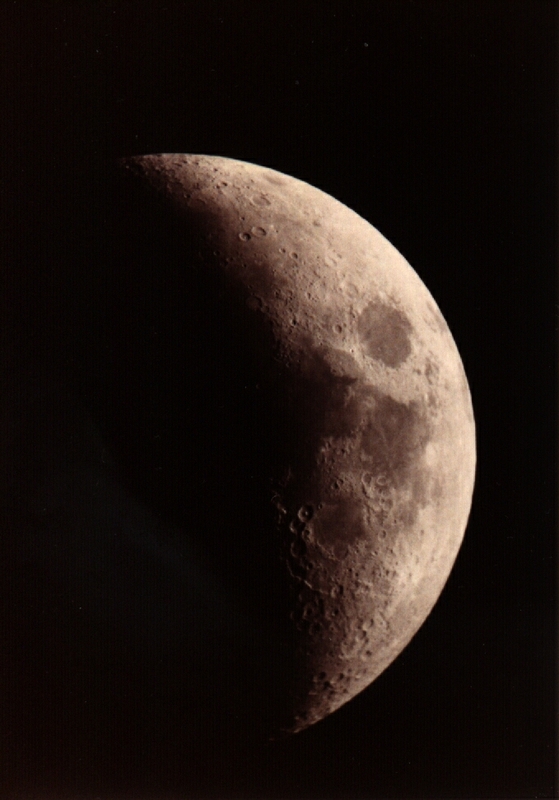 Taken using the same setup as above, a Canon AE-1 with a 50mm f1.4 lens piggy-backed on a Meade 2080B. The exposure time was 1 minute on Kodak 400 Royal-Gold color film. Photographed from the BRAS observing site at the Idlewild Research Center, Clinton, Louisiana. The black lines running through the image are power lines in the field of view. Taken using a 35mm SLR camera at prime focus through a a Meade 2080B SCT. These are 3 pics I took around 09:50 on the 29th. 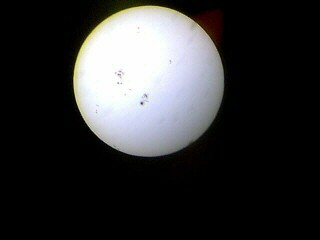 I have an 80mm refractor and of course a solar filter. 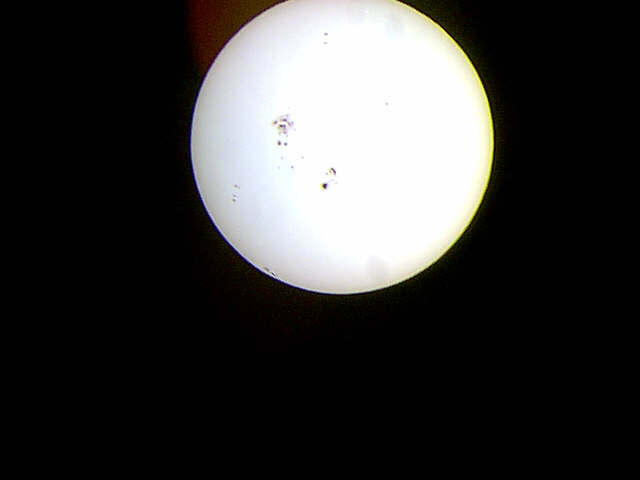 I took my dig cam and just held it up to the lens and snapped about a dozen pics and these 3 showed the sun. I bought a device from Orion that holds the cam but I have never been able to get it to line up to see anything soe I just held it up there and shot away. 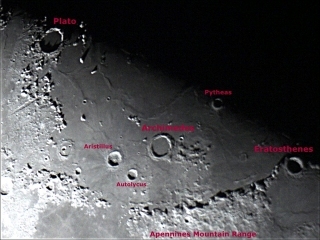 My first astro pics. I was happy! These are 3 pics I took around 09:50 on the 29th. I have an 80mm refractor and of course a solar filter. 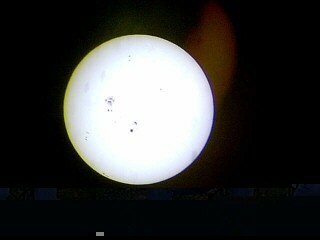 I took my dig cam and just held it up to the lens and snapped about a dozen pics and these 3 showed the sun. I bought a device from Orion that holds the cam but I have never been able to get it to line up to see anything so I just held it up there and shot away. My first astro pics. I was happy! 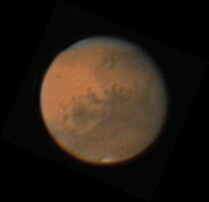 Took the picture with an 80mm refractor at 36x using a handheld digital camera. 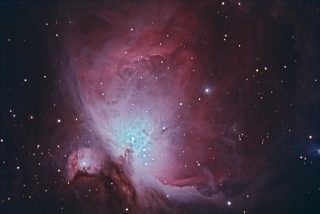 Imaging scope: Celestron 6" Newtonian. Camera: Canon T1i. Mount: Celestron AVX mount. Camera was connected to the telescope with a T Ring. Imaging scope: Celestron 6" Newtonian. Mount: AVX mount. Camera: Canon T1i. This is a stack of 23 frames at 180 sec per frame unguided for a total exposure time of 1 hour and 9 mins, 25 dark frames, 30 flat frames, 25 bias frames. 10 frames @ 4:00 exposure on each frame. 20 Dark Frames, 25 Flat frames and 50 Bias Frames. All subs were taken unguided. Imaging scope is a Celestron 6" Newtonian on an AVX mount. Camera used was the Canon T1i. 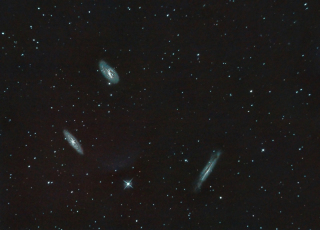 Subs were taken using the Astronomik CLS light pollution filter. 14 x 180s subs, 25 dark frames, 31 flat frames, 50 bias frames. 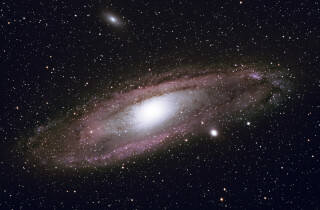 Telescope: Celestron C6N. 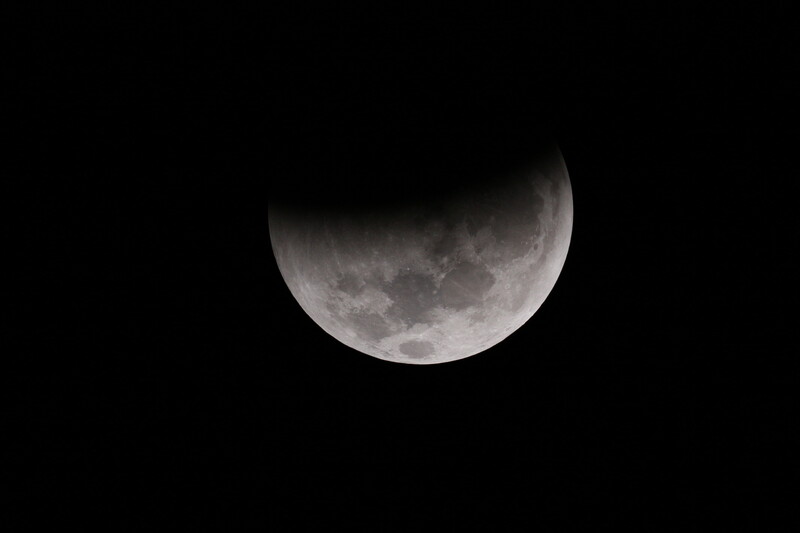 Camera: T1i with Astronomik CLS filter. Mount: AVX mount unguided. 15 light frames @ 4 mins each. 15 dark frames. 50 flat frames & 70 bias frames. 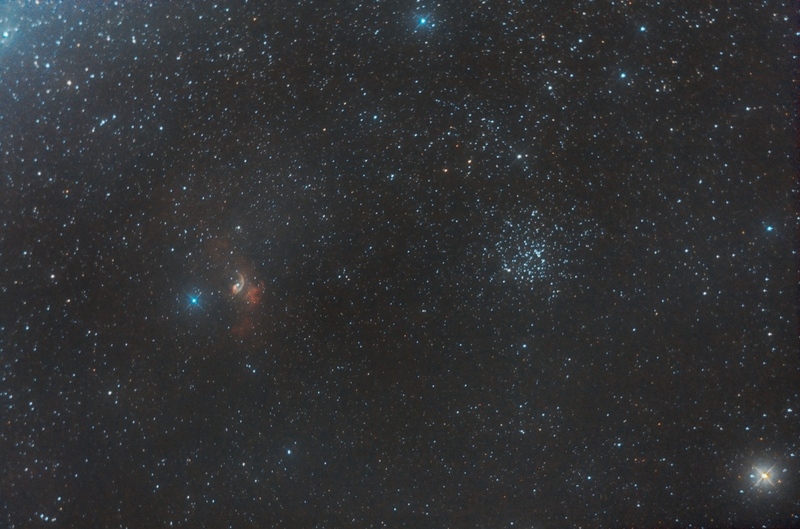 Stacked in DSS and processed in PixInsight. 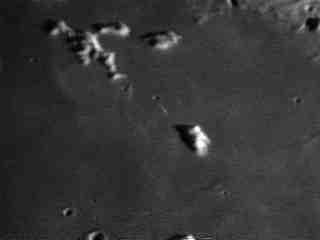 Recorded 1:40 secs of video using a ZWO ASI120MC planetary camera, software used to capture the video is Sharpcap, Then processed the video in Registax 6. Recorded 1000 frames of video using a ZWO ASI120MC as my camera and Sharpcap as my video software. 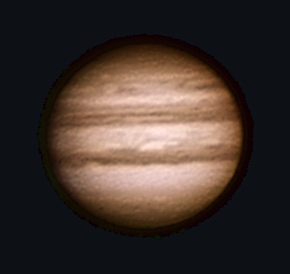 Stacked and processed in Registax using the Wavelets tools and adjusted the Histogram. 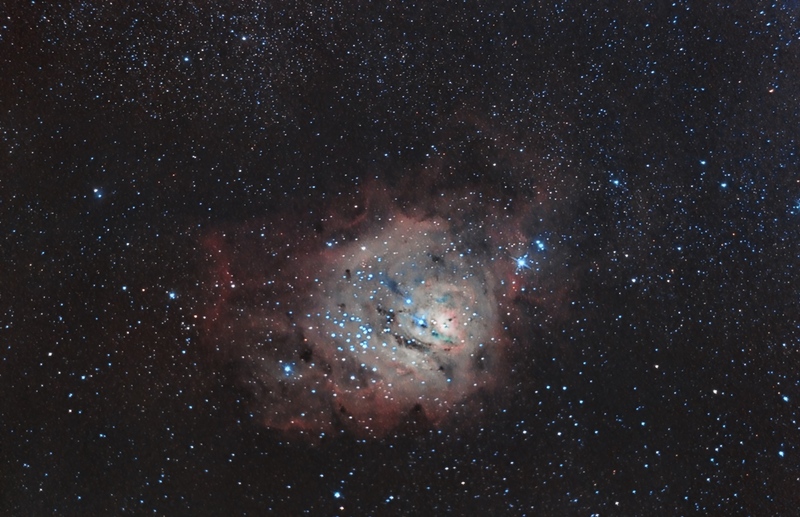 17 4 min exposures, stacked with Deep Sky Stacker and processed in PixInsight. 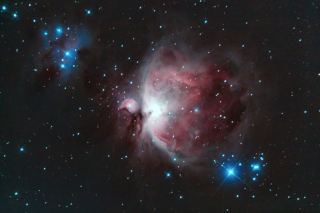 Used phd2 as my guiding software and the ZWO ASI120MC as my guide camera and Orion 50mm mini guidescope. Images were captured with the Canon Rebel T1i and I used the Astronomik CLS light pollution filter. Camera: Canon T1i. 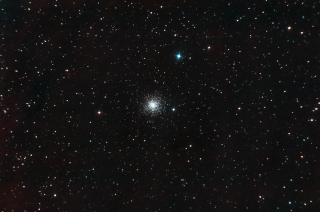 Telescope: Celestron 6 in Newtonian. Mount: Celestron AVX. Guiding software: phd2 guiding. Took 11 - 300 sec exposures, 6 - 300 sec dark frames, 40 flat frames and 50 bias frames. Stacked in Deep Sky Stacker and processed with PixInsight. 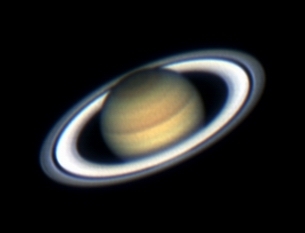 28 x 4 min light frames,15 x 4 min dark frames, no flat frames and no bias frames: All images were stacked in Deep Sky Stacker, then processed with PixInsight. 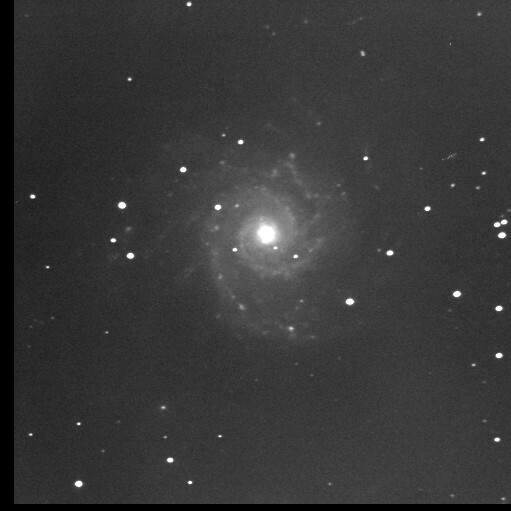 Camera - Canon T1i, Telescope - Celestron 6 in Newtonian on an AVX mount guided with phd2 software. Camera: Canon T1i, Imaging scope: Celestron 6" Newtonian, Guide Scope: Orion 50mm guide scope, Guide camera: ZWO ASI120MC. 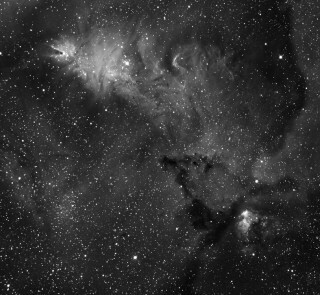 Images and calibration frames: 16 240sec light frames, 25 240 sec dark frames, 40 flat frames and 100 bias frames Stacked in Deep Sky Stacker and processed in PixInsight. Images were shot from my driveway. Imaging scope: Celestron 6" Newtonian. 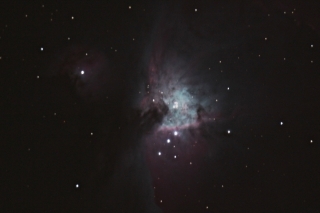 Camera: Canon T1i, Orion 50mm guide scope, ASI120MC guide camera, phd2 as my guiding software. 9 x 240 sec light frames, 30 x 240 sec dark frames, 40 flat frames, 200 bias frames stacked in Deep Sky Stacker and processed in PixInsight. 39 - 4 min light frames, 20 - 4 min dark frames, 41 flat frames, 200 bias frames. Imaging Scope is Celestron 6" Newtonian. Camera is Canon T1i. Guide Scope is Orion 50mm autoguider. Auto Guider is ZWO ASI120MC. Guiding software used is phd2. Shot was taken from my driveway. 11 - 4 min light frame subs for a total of 44 mins exposure time. 8 - 4 min dark frames taken right after the light frames. 40 flat frames - I used an LED flat panel laid on top of a white t-shirt to give an flat illuminated surface. 100 bias frames. 14 - 300 sec Light Frames. 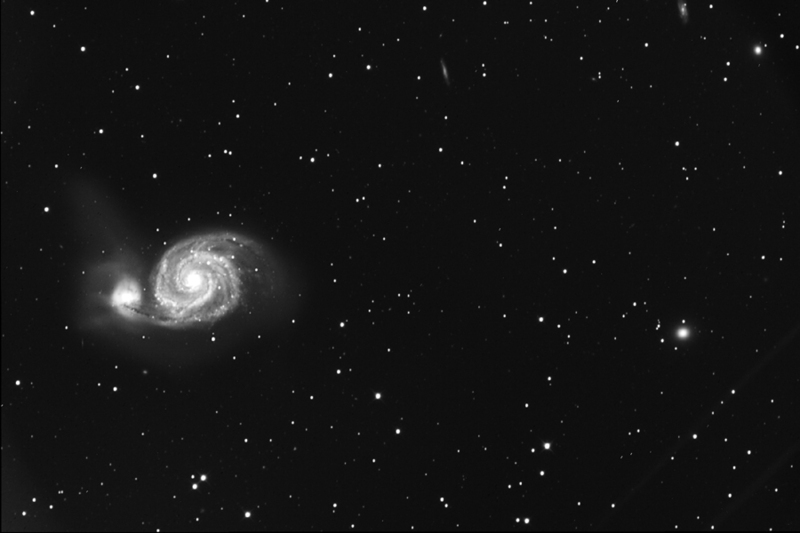 8 - 300 sec Dark Frames. 40 - Flat frames. 200 - Bias Frames. 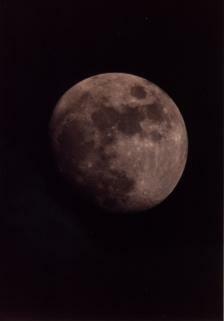 Taken with a canon T1i through a 6" Newtonian scope. 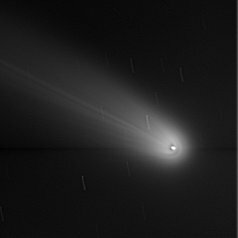 This is a reprocess and crop of the entire image which also shows the Flame. 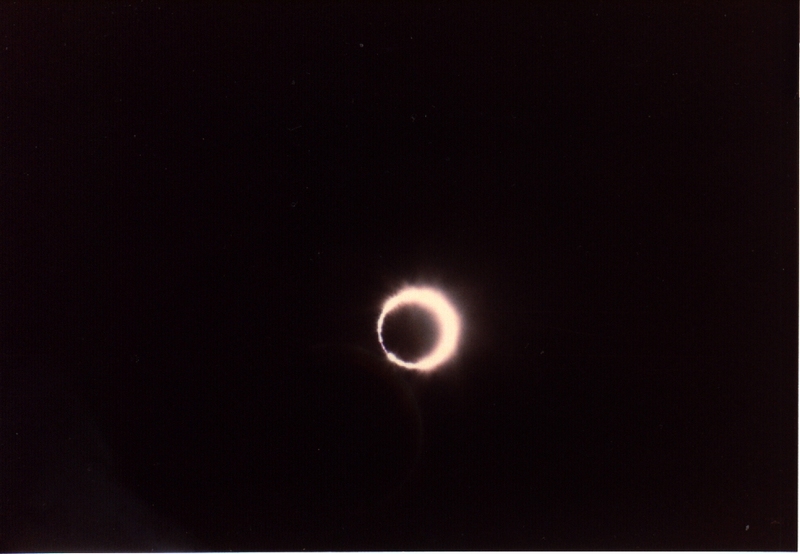 Taken near totality with an 8" f/10 focal ratio Meade LX-50 SCT, using an f/6.3 focal reducer, K-1000 Pentax 35mm camera at prime focus, and Fuji 400 Superia print film. Exposure time was approximately 8 seconds, and the image was cropped and manipulated for contrast with Adobe Photo Deluxe and Paint Shop Pro software. 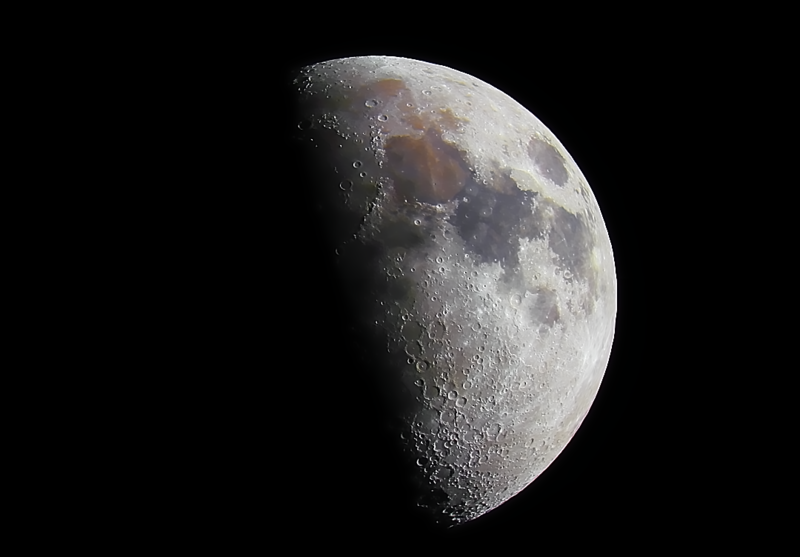 Taken through my 100mm Orion desktop scope with my Canon Rebel T3 with T-ring and adapter. Camera Settings was 100 ISO and speed was 1/125. Taken through my 100mm Orion desktop scope with my Canon Rebel T3 with T-ring and adapter. Camera Settings was 200 ISO and speed was 1/125. You see Venus hanging low on the horizon on the left side of the pic and just to the right of it you can see a very faint streak. This is the Hubble Space Telescope which flew by on November 29, 2013 at a .8 magnitude. 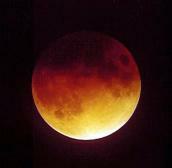 The camera I used was my Canon Rebel T3 with ISO set at 400, F5, and exposure setting set at 15 seconds. 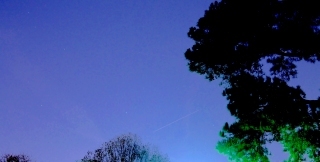 The streak you see between the two trees is of the International Space Station flying over at a -1.6 on December 10, 2013, coming out of the west at 6:09 pm. I used my Canon Rebel T3 settings 400 ISO, f5 and 15 second exposure. This picture shows a polar ice cap. No other information given. 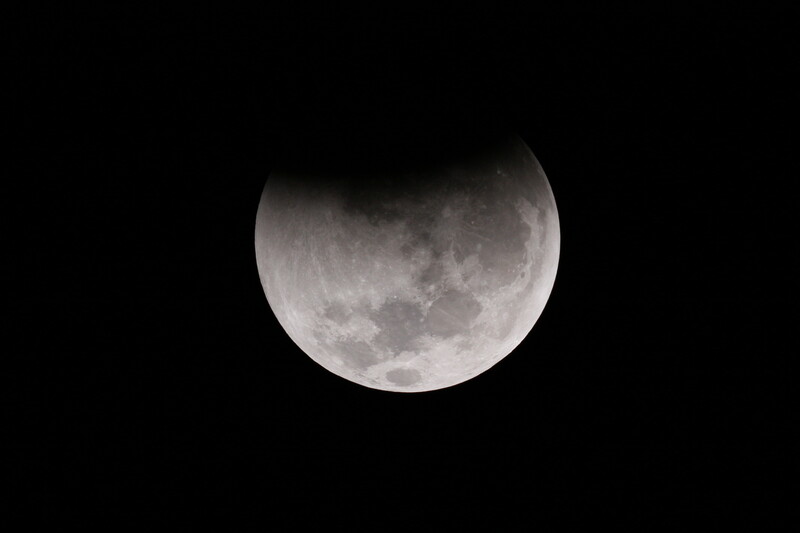 ISO 200 f11-1. No other information given. 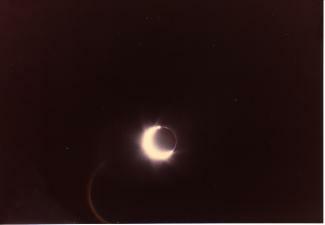 OA/1, 28mm Lens, 28mm Eyepiece, 1/1000 f11. No other information given. 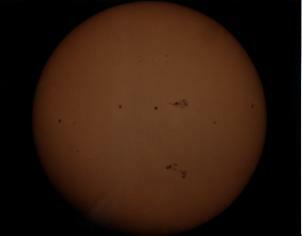 ISA/16, 28mm Lens, 28mm Eyepiece, 1/1000 f8. No other information given. 10 inch f5.6 Dobson, 8mm RKE (178x), 50mm f1.8 Lens, ASA 400 film, 1/15 second exposure. 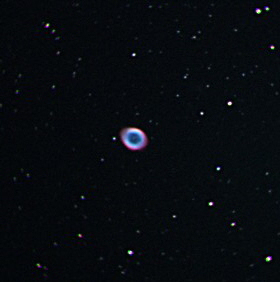 10 inch Dobson at 45x, 32mm eyepiece, 50mm Lens, Wratten ND 4.00 filter, Ektar 25 film, 1/125 second exposure at f19. 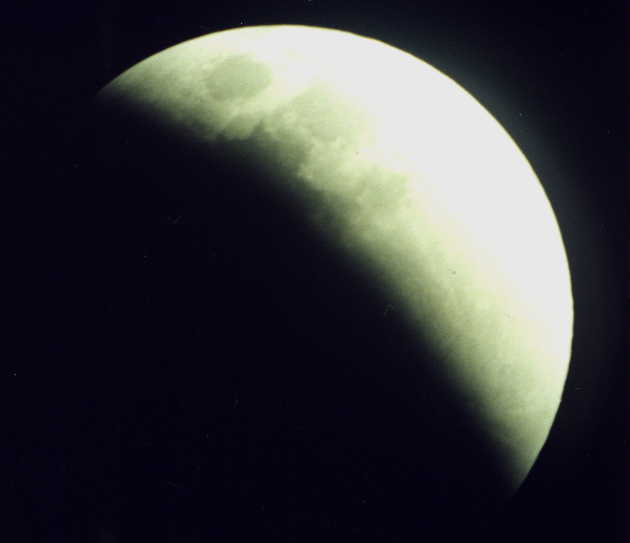 Lunar Eclipse February 20, 2000 JPEG image 503KB. Multiple exposure of the Moon in totality from 10:06 PM to 11:20 PM CST. 6 second exposure every 6 minutes with a Nikon FM2, 115mm f3.5 lens on AGFA Optima ISO 400 film. Taken in Baton Rouge. Taken with ISO 200 film, exposure time of 1/125 second, with a Thousand Oaks type 2+ filter, on a Meade ETX 125EC telescope. Multiple exposure of the November 8th, 2003 Lunar Eclipse from 7:00 PM to 7:48 PM CST. 3 second exposure every 4 minutes with a Nikon FM2 at 150mm on AGFA Optima ISO 400 film. Shutter open on "13" with "Black Hat" over lens. First two and last two Moon images not in totality. Taken in Wesson, Mississippi. The film used was Fuji 800 Super G Plus with an exposure time of 5 minutes at f/4.5. A 400 mm telephoto lens was used with my Pentax ME Super SLR camera piggybacked to my 8" Meade LX-50 SCT. This was the first time I had seen Hale Bopp in dark skies away from Baton Rouge. It was spectacular! 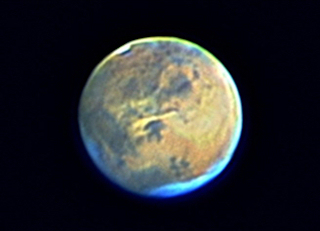 Image reprocessed November, 2003. Here's a photo taken in Clinton, LA. 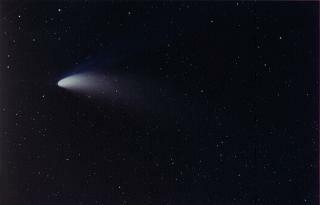 at our BRAS Hale-Bopp Comet viewing session. 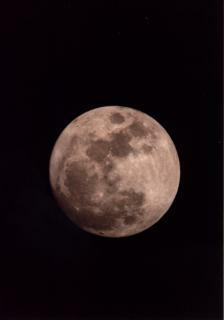 This was taken with Fuji 800 Super G Plus film through a 50mm camera at f/2 for 4 minutes piggyback to my 8" Meade LX-50. 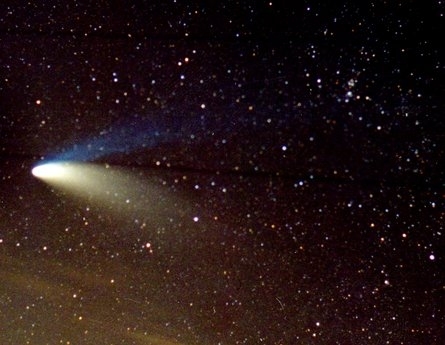 Ion tail is visible at 1 o'clock with dust tail visible at 2 o'clock. M-45 (The Pleiades) is visible in the left upper corner of the picture. Wish the power lines weren't in the way but otherwise, I am pleased with it. 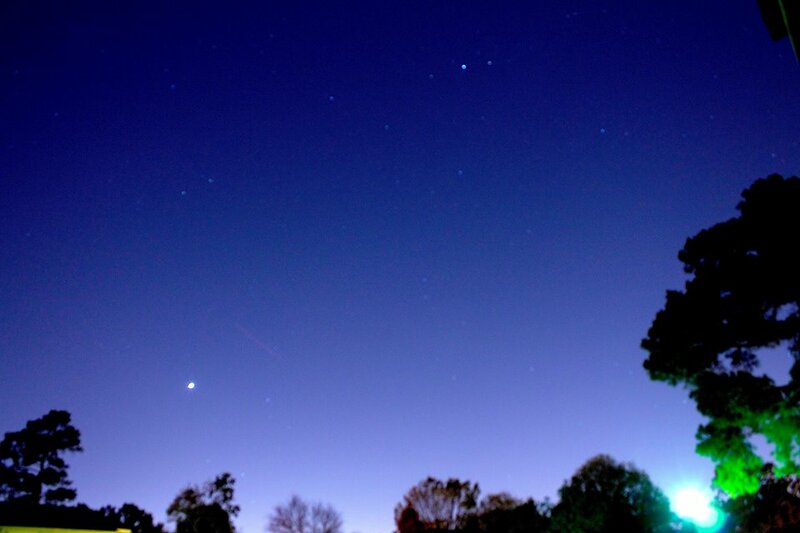 There is a light streak in the background which is either an airplane or might even be a meteor. We did see several meteors that night. Photo taken on 9/25/03 at 10:30 pm with my new 10" LX200 SCT and an Olympus 2100 Digital camera hooked to 12mm Nagler at almost full zoom. Photo taken at f3.2 at 1/30th second exposure. 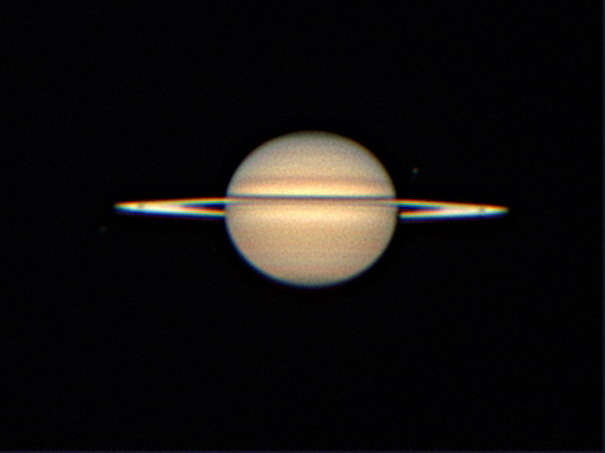 50 frames stacked in Registax v2. 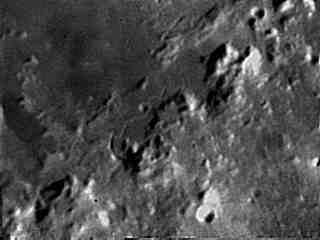 Photo group taken on 10/28/03 at 3:00 pm through 10" LX200GPS at f/6.3 with a Olympus 2100 Ultra Zoom Digital Camera afocal on a 40mm MaxView Eyepiece. Jupiter image taken on 11/16/03 from Baton Rouge with ToUcam Pro II Web camera (unmodified) attached to my 10" LX200GPS f/10 with 2x barlow. Image taken with setup at f20. 2489 frames stacked and processed in Registax v2.1.13. Saturn image taken on 12/30/03 from Baton Rouge on 10" LX200GPS with 2x barlow and ToUcam Pro II web camera. 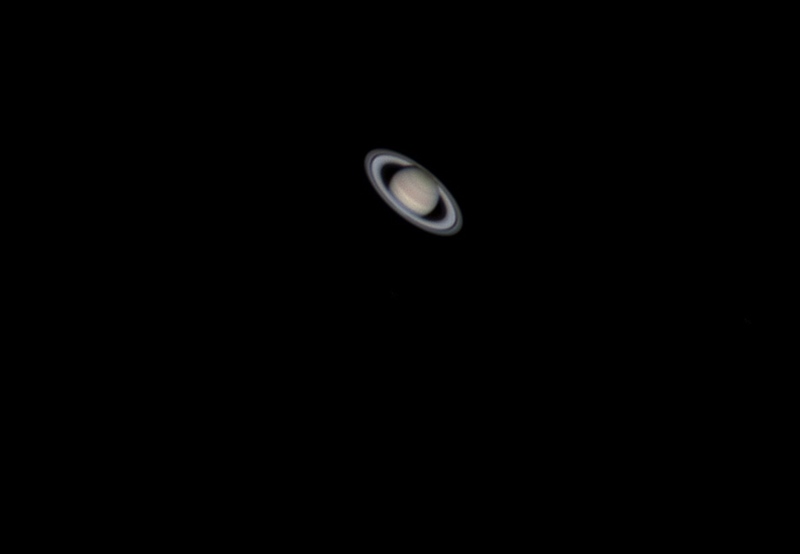 1600 images stacked and processed in Registax. Skies Over Texas Star Party - Images taken with 10" LX200 and SBIG ST-7ME CCD camera. Taken with 10" LX200 and digital camera. 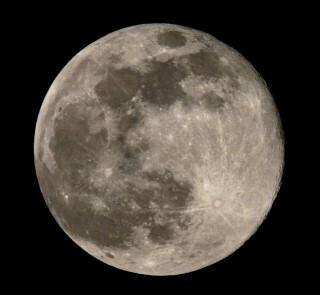 Taken with Canon 10D and Tak Sky 90 - 20x3 min. Images processed in Images Plus. Taken with 10" LX200 f/20 and ToUcam Web camera. Taken with Canon 10D through 10" LX200 at f/6.3. 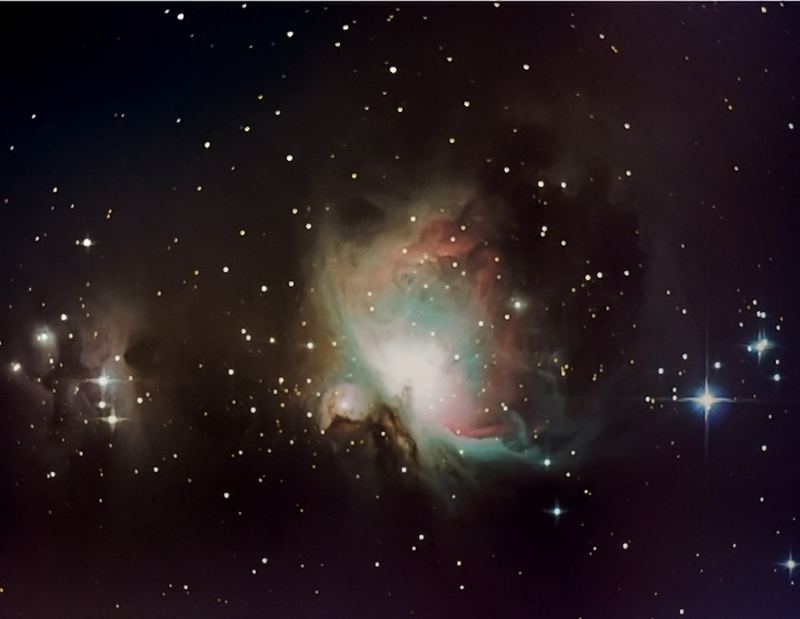 Taken with a Tak Sky 90 f/4.4 and Canon 10D Digital Camera, 60x1min images, processed in Images Plus and ACDSee. Taken with 10" LX200 f/40 and ToUcam. 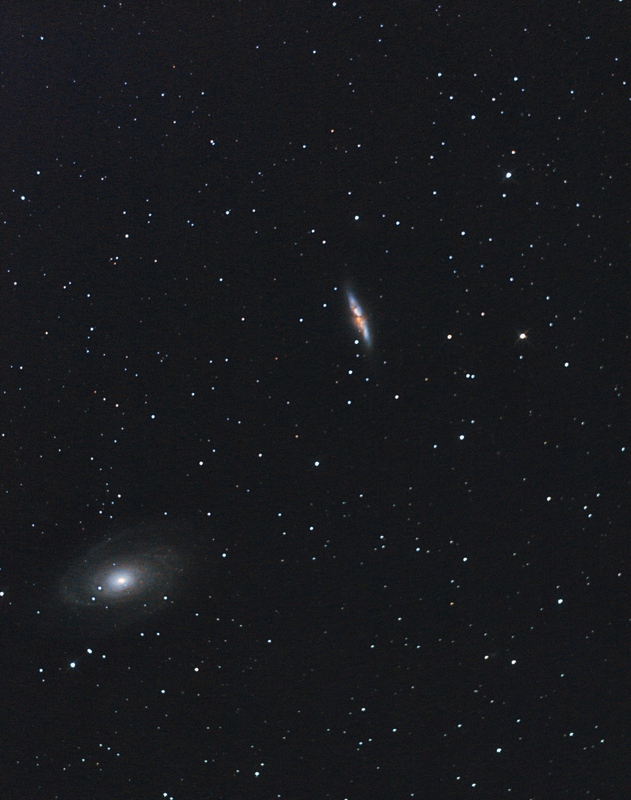 Imaged with Tak 90 Refractor at f/4.4 and Canon 10D, 24x5min Images Processed in Images Plus. Imaged with Tak 90 Refractor at f/4.4 and Canon 10D, 12x5min Images Processed in Images Plus. Comet 21P/Giacobini-Zinner Movie September 14, 2018 Embedded Youtube movie. Last updated on Tuesday, October 30, 2018, 01:10 PM.